My computer hard drive is bursting at the seams with literally thousands of digital photographs. Sometimes it feels a shame to hide them all away. Once viewed a folder is often forgotten, similar to hiding prints in the attic. 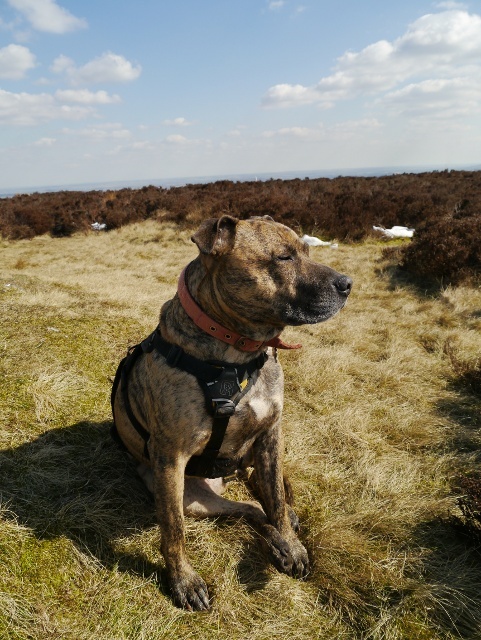 I have thought about filling the living room with images of mountains and moors and of course Reuben. As an experiment I have ordered a small canvas print. 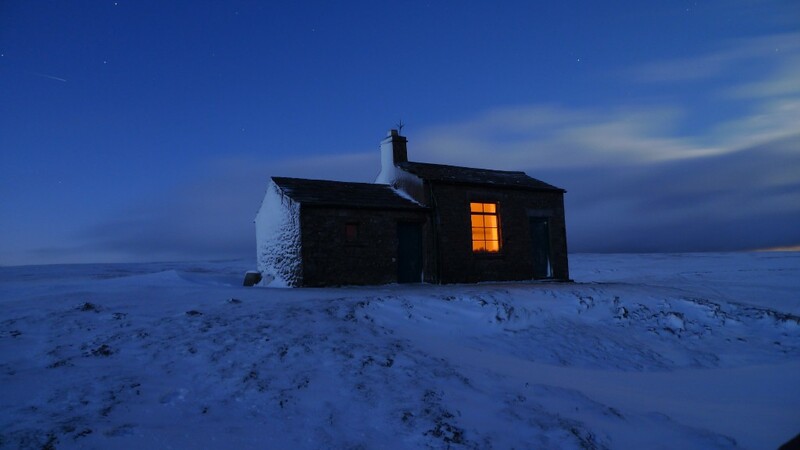 A memento of a night on the winter hills in front of a roaring fire with my canine pal. 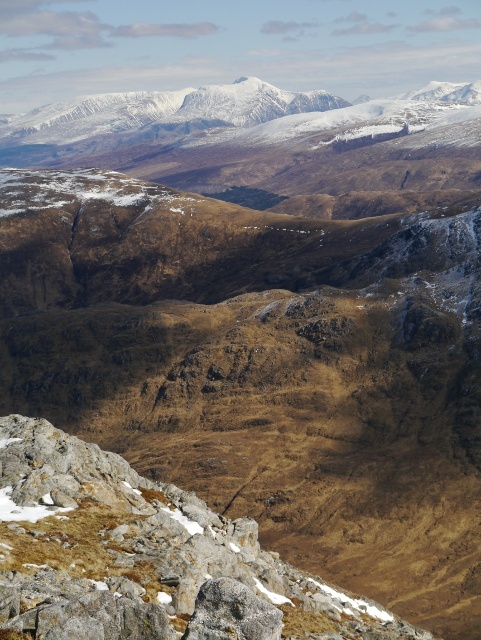 The clock really does seem to be ticking this year with regards to the approaching TGO Challenge. After a Friday off work lounging in bed (due to complete laziness rather than illness) I decided that I really should make a half arsed attempt at getting fit. 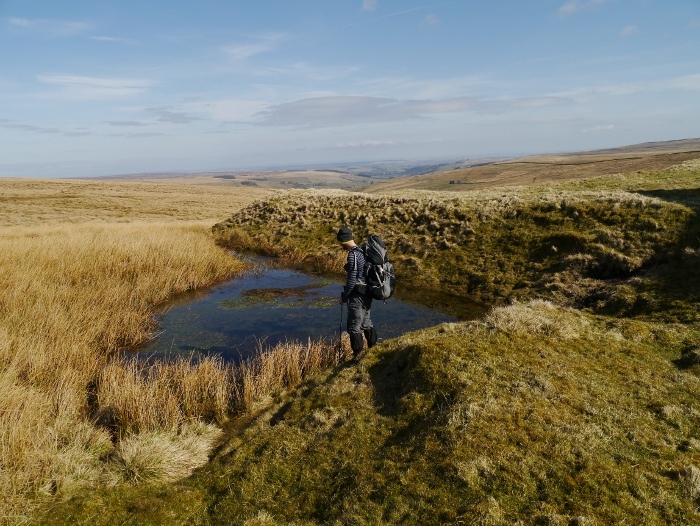 I had backpacked the previous weekend but that turned into a bit of a slackpacking adventure, rather than gobbling up the miles as planned. 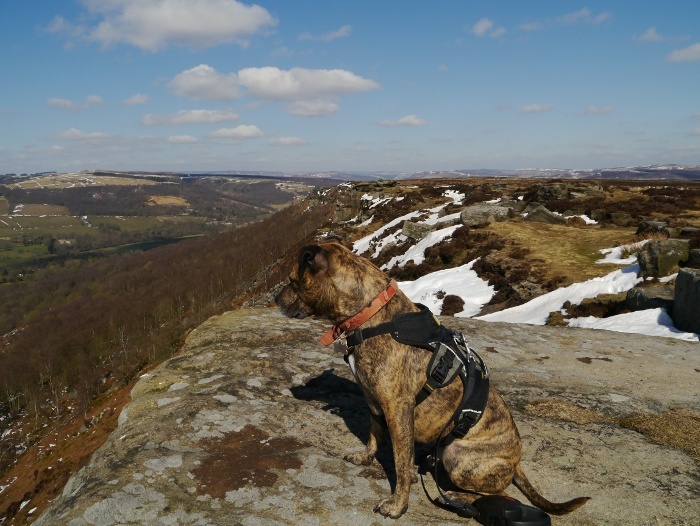 So early on the Saturday morning I took a rather excited Reuben to the nearest part of the Peak District, less than an hours drive away. 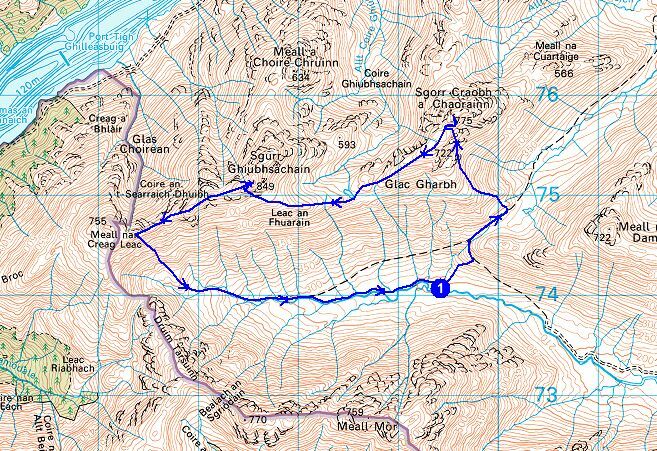 Most of my days on the TGO Challenge are around twenty to twenty five kilometres. I thought that I should at least attempt that distance with a day pack. I had also just got a new pair of Inov8 Flyroc 310’s. After a few months in leather boots over the winter, it was a good opportunity to break them in and get my feet used to trailshoes again. 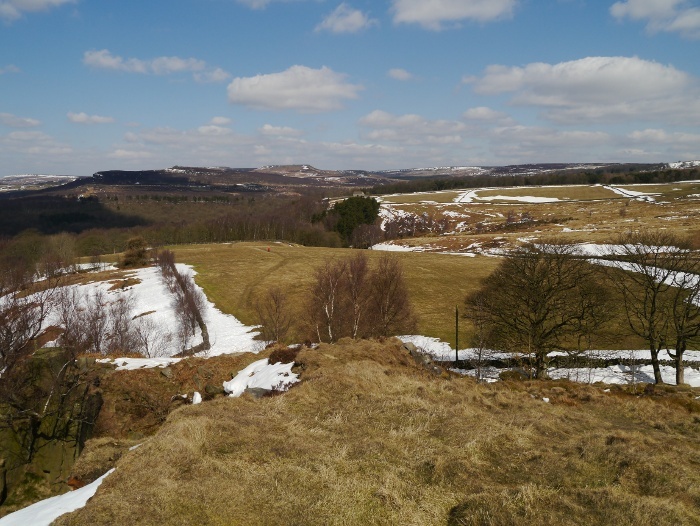 The car park below Birchen edge is one of those rare ones that remains free, you need to get there early to get a place. Whilst enjoying a banana from the comfort of my car, I watched a group of ramblers kit up for what looked like an Everest expedition. Reuben however had no interest in people watching and signalled his impatience from the back seat. As we left the car park I admired the fact that one couple had brought stools so that they could put their walking boots on in comfort. They even had matching bags to put their footwear in that looked to have been designed for that purpose (they were boot shaped). People are fascinating creatures. 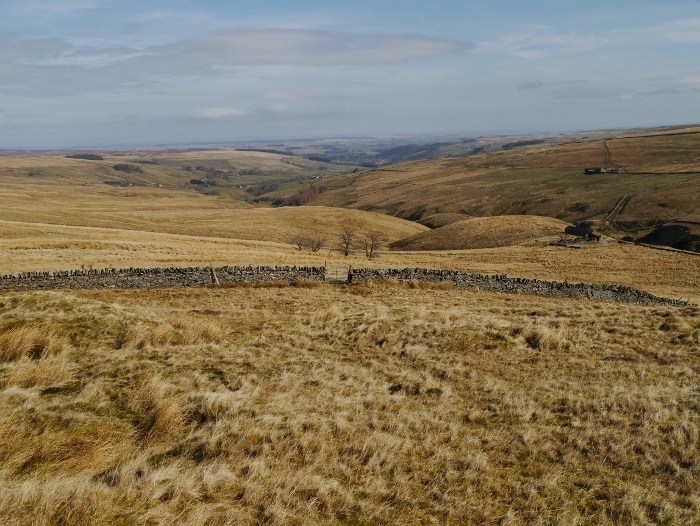 The path over the shoulder of Gardom’s edge to the main A621 is an enjoyable one, low open moorland followed by wooded slopes. Crossing the road we then walked along the edge of some stunning grounds of a large house. It’s all tumbling brooks and stones and trees and makes me feel rather jealous each time I pass through. If I owned it I’m not sure if I would want unwashed ramblers walking through. 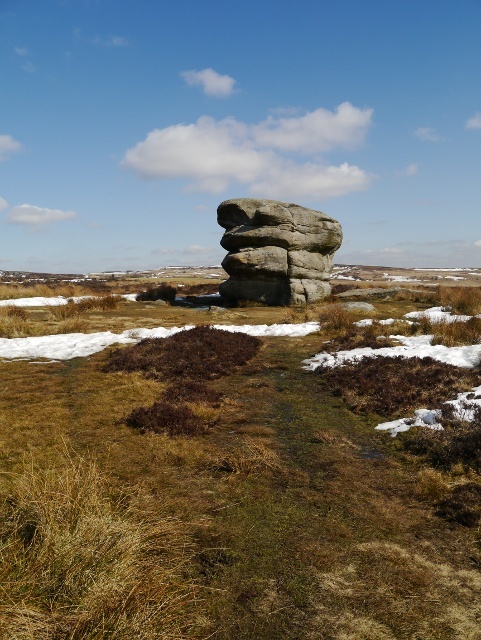 A sweaty climb in the dappled shade of woodland brought us to Baslow edge and the impressive Eagle stone. 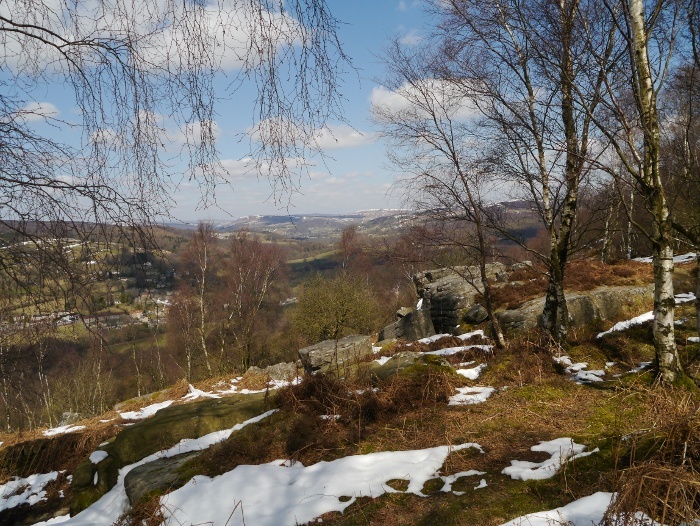 For the next few miles along first Baslow, Curbar and then Froggatt edges you are reminded that large conurbations are not very far away. On this sunny day the place was heaving with every man, child and dog. Although I do have misanthropic tendencies it is great to see so many people out enjoying such a great place. It’s not somewhere to come to get away from it all, so with that mindset I enjoyed the hustle and bustle. I wonder what Tracksterman would make of the place? Reading his post dated April 8th gives me some idea…………….. 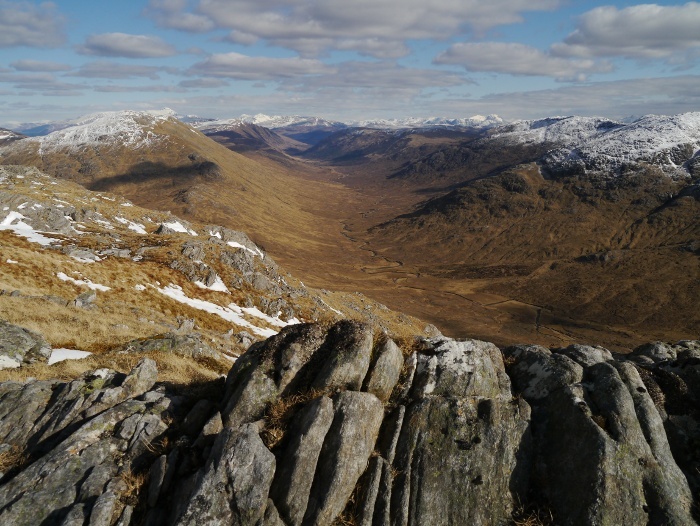 Anyway, the views as we walked north were spectacular, somewhere where it is hard to resist the temptation to sit and gawp every now and then. Another main road soon shattered the idyllic scene but was quickly left behind as we entered Hay wood. Here Reuben involuntarily lost his virginity to an over enthusiastic labrador twice his size. Worth the price of admission alone to watch the well spoken elderly owner trying to get it to dismount. 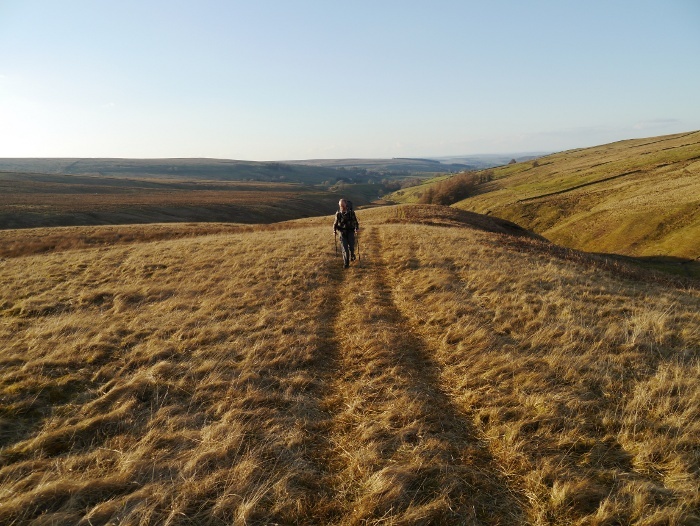 Reuben took this undignified intrusion into his walk in his stride, although I did notice some nervous backwards glances for a few hundred metres. 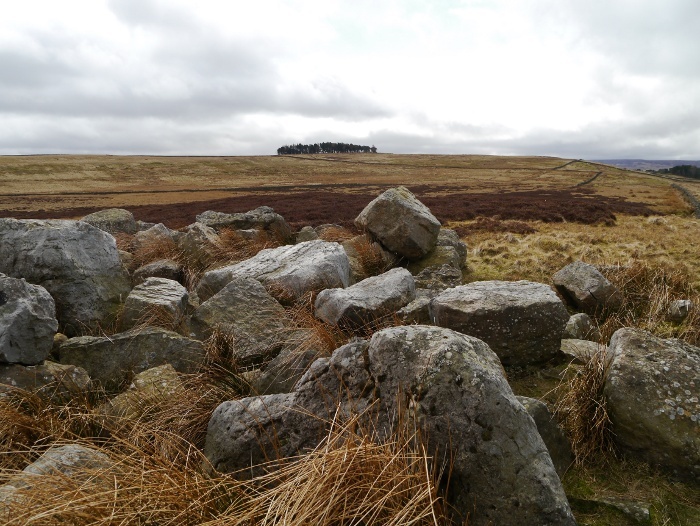 Our lunch time destination was Tumbling hill, a fantastic perch within access land but off most people’s radar. An enjoyable half hour in the sun with a flask and a dog who had a keen interest in my sandwiches. 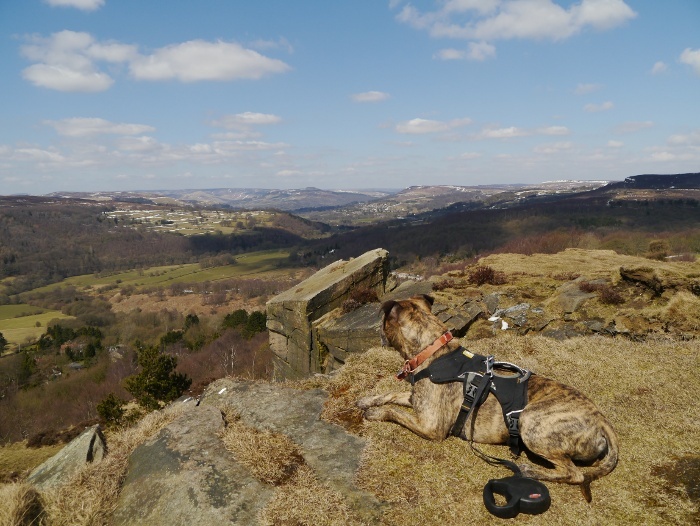 A short walk along the main road was followed by a pleasant track through the Longshaw Estate where Reuben was confronted by a mob of children who wanted to say hello. I’m not really sure what he makes of little people, in Nottingham he views them as a free source of footballs. Fox House to a pedestrian is an obstacle course of fast-moving traffic and badly parked cars on the verges. 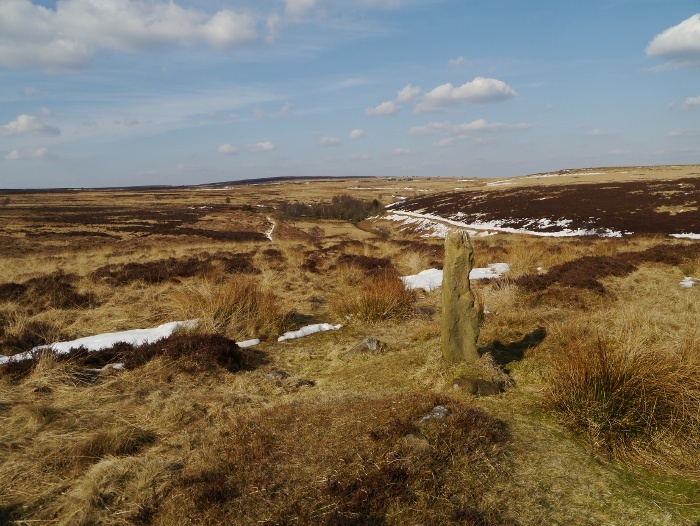 It was with relief that the chaos was left behind for a walk across Totley Moor. 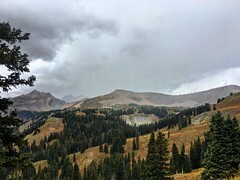 This was a place of lingering snow, deep and wet under the warm sun. 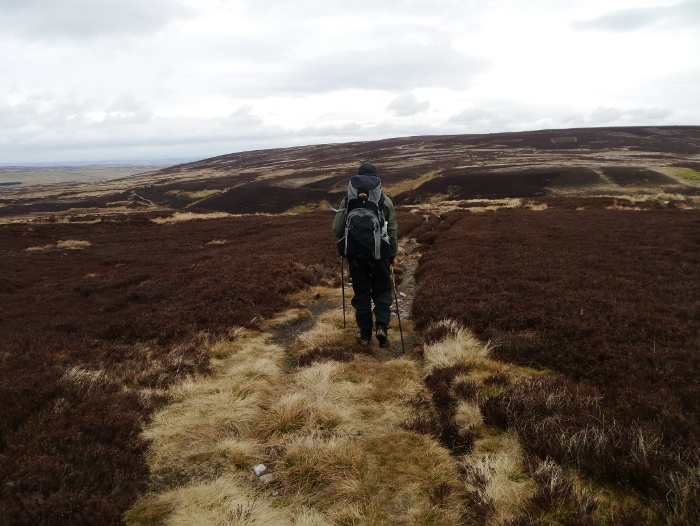 It was a bit of a struggle to be honest, especially in trail shoes which were soon cold and sodden. 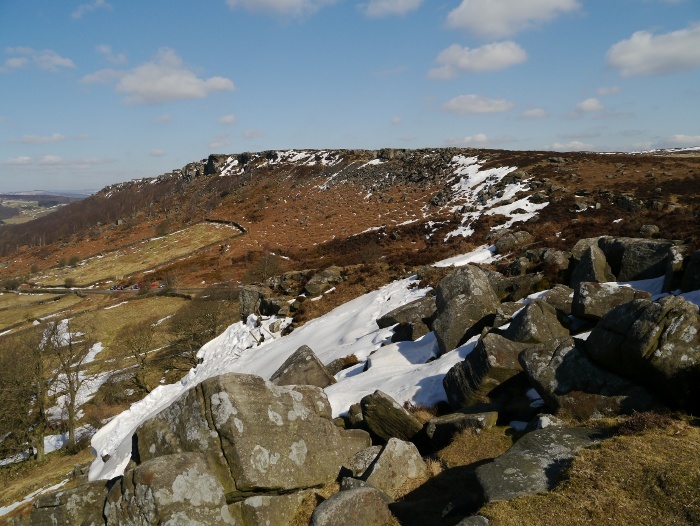 The snow that did not hold would deposit me in the freezing cold bog hidden underneath. There was a bit of cursing involved. 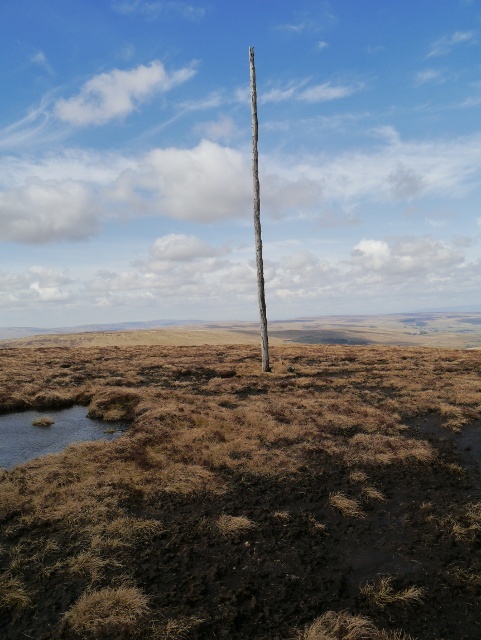 The trig point on Totley Moor at 395 metres was the highest point of the day, another pleasant spot to laze in the sun with Reuben. 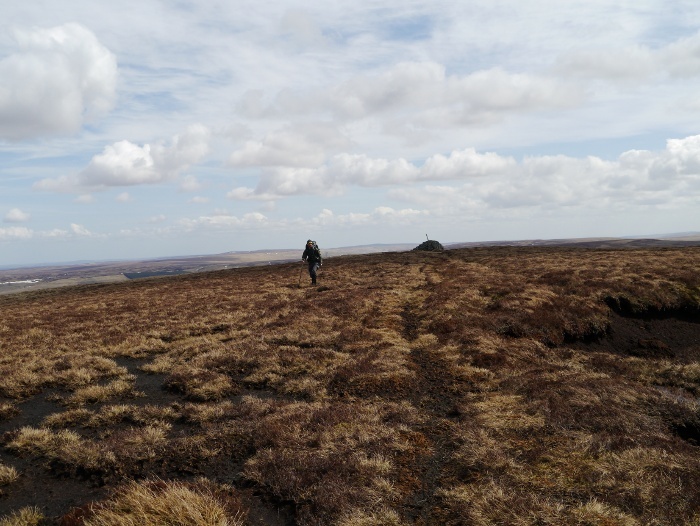 Descending towards Barbrook bridge via an ill-defined path the ground became marshy. 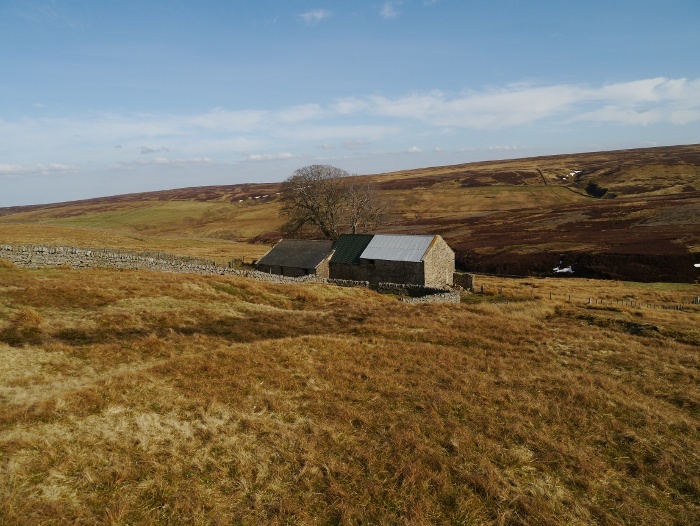 There is a distinctive feel to these eastern moors, a blend of fen and trees. 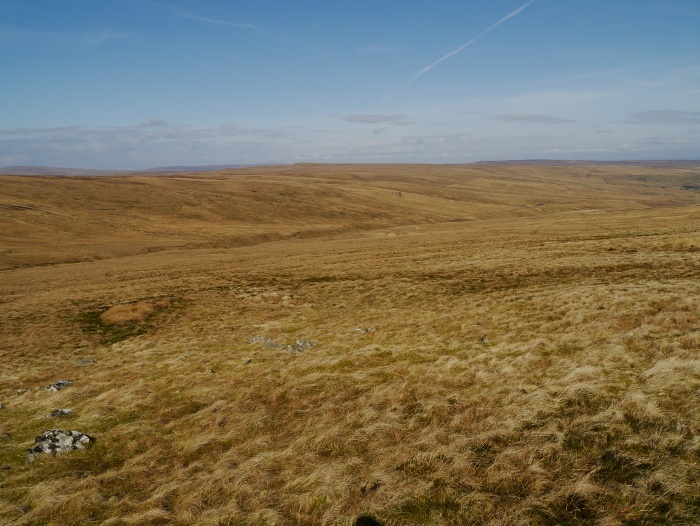 An area ignored by most as they head to the edges just a couple of miles away. 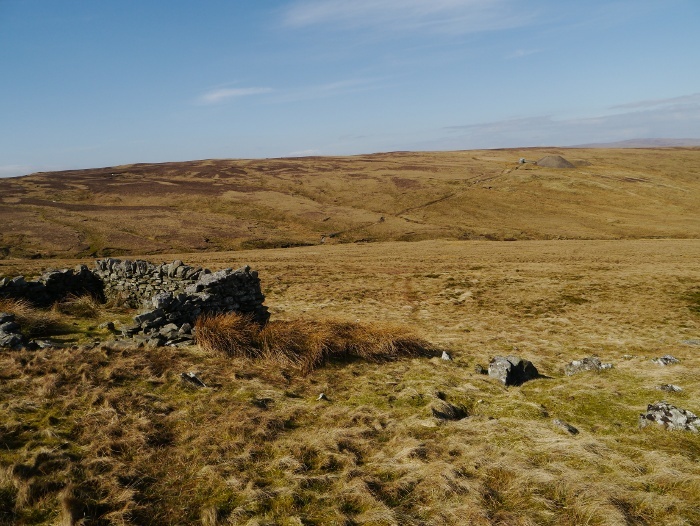 The gate giving access to the track down Bar Brook was locked, barring the way to access land. This was annoying and it was difficult hauling Reuben over the top. A pedestrian access point really should be provided. 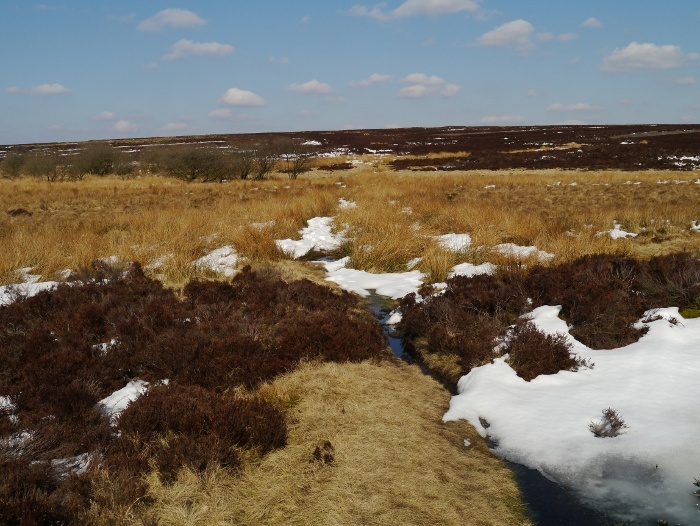 It’s a pleasant walk through the shallow valley and we managed to hop over the stream lower down to gain access to the expanse of Big Moor. 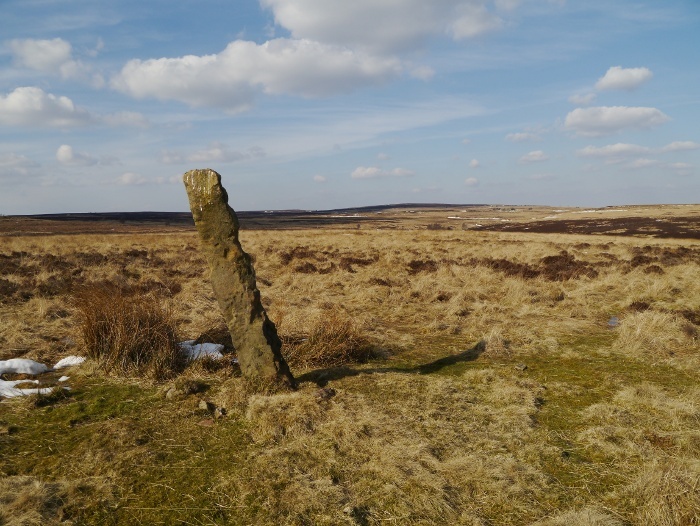 Here on a trackless walk to Swine Sty we came across a couple of standing stones that are not marked on the map. For a moment I was transported to Dartmoor. 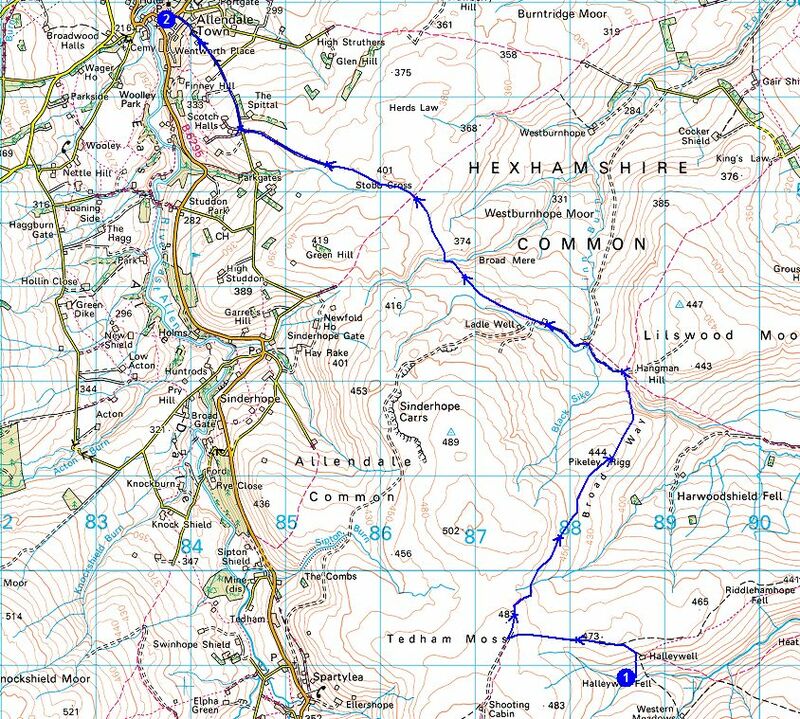 I had planned to walk the length of Birchen edge but tiredness and the desire to get home and order a curry got the better of me. 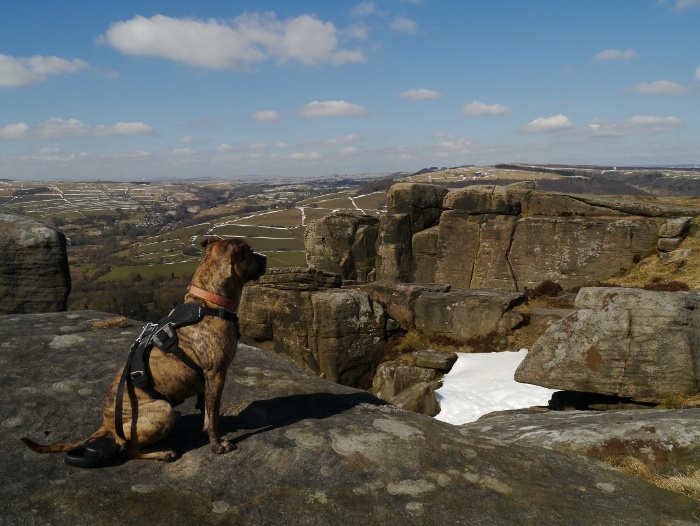 Instead we were accompanied by the clinking of climbing gear as we made our way back to the car under the wall of gritstone. 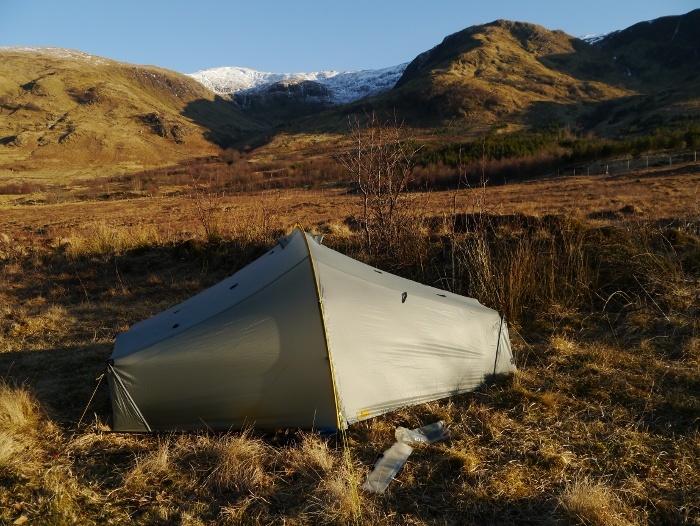 After another very cold night I enjoyed festering in my sleeping bag for a couple of hours whilst the morning sun warmed the tent. There is something deeply satisfying about not having a schedule when in the hills, you can make things up as you go along. One of the benefits of backpacking solo. Especially when you prefer the slackpacking approach like I do. I thought that I did pretty well, eventually getting up at 9.30am. However there was some initial confusion when the time on my mobile disagreed with my watch. I then remembered that the clocks had gone forward and it was in fact 10.30am. Now that’s not so good. I just about managed to pack up and set off on the morning side of noon, heading back towards the diggers. Despite the dry and crunchy ground I still managed to find one well camouflaged booby-trapped bog. 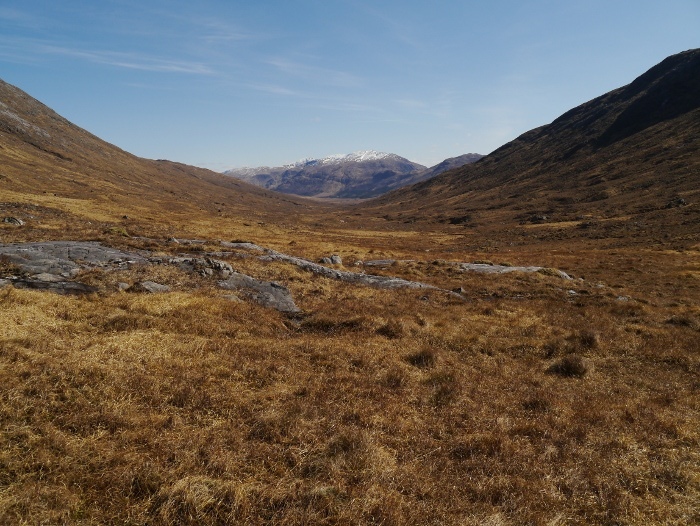 I left a trail of black goo in my wake as I crossed the Cona River and made my way up towards an un-named bealach. 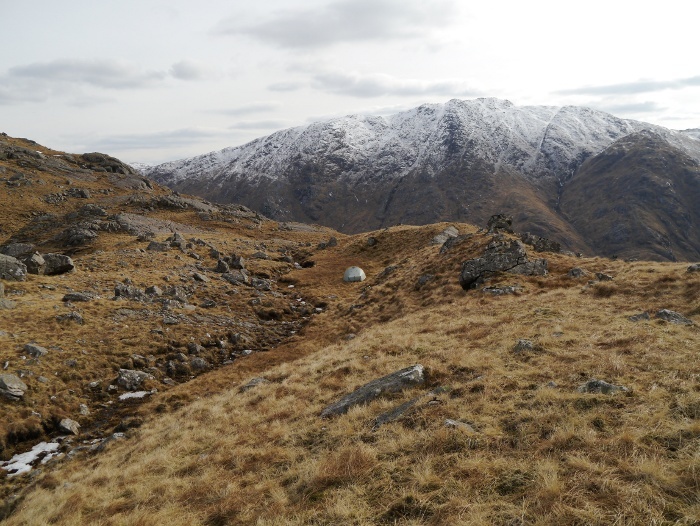 I passed the only person that I would see all weekend as he descended towards the Cona Glen. A brief chat and we went our separate ways. 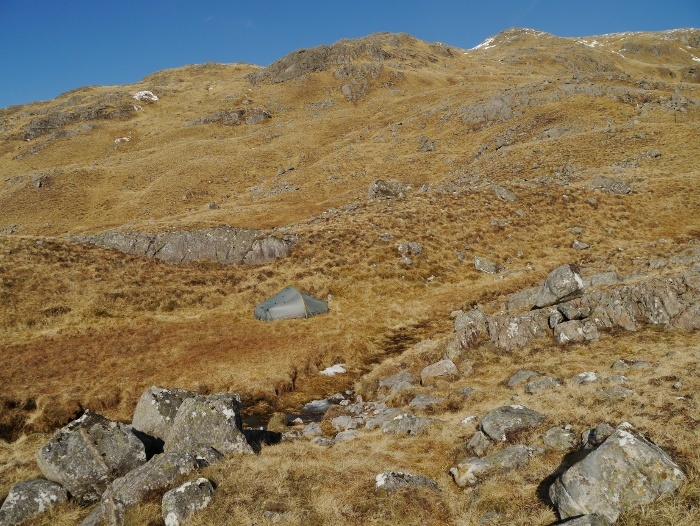 With no pack on I wondered if he was wild camping nearby as the nearest road was a few hours away. 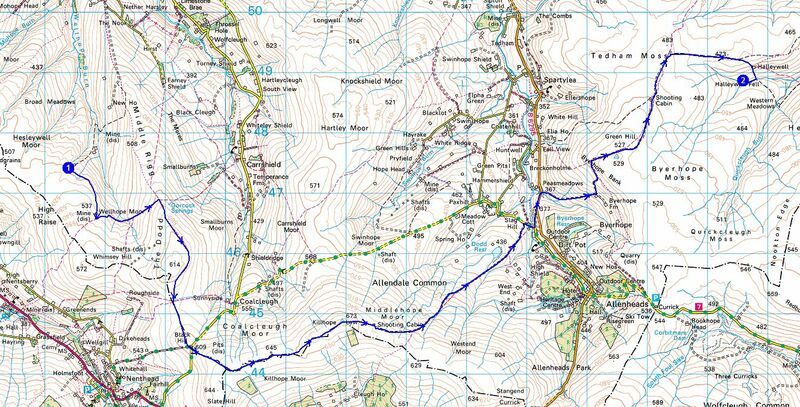 Upon reaching the rugged bealach my intention to meet up with Andy in Glen Scaddle fell by the wayside. I heard a trickle of water and found a patch of flat ground that had been exposed to the sun. 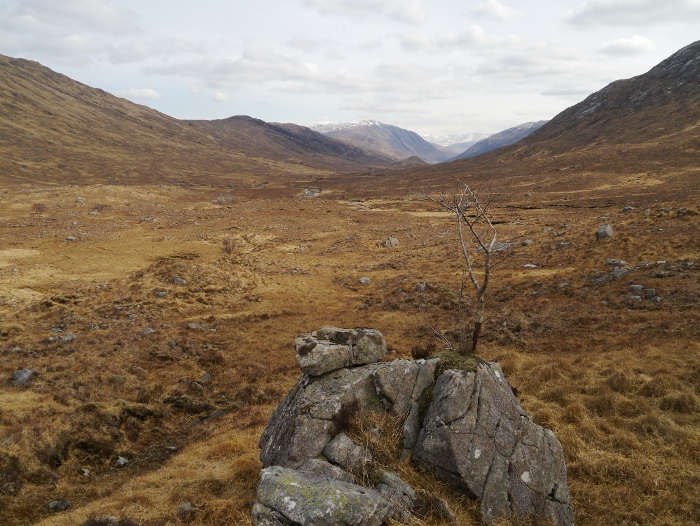 I made a spur of the moment decision to pitch and then climb Druim Tarsuinn without a full pack. With tent up and water collected I cooked a hot lunch and lazed around for half an hour. 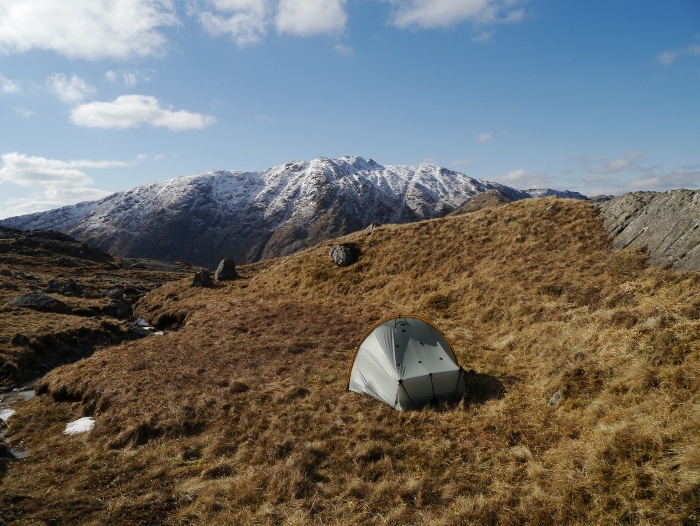 I then packed a few essentials before heading up grassy slopes, careful to look back and pinpoint where the tent was pitched. 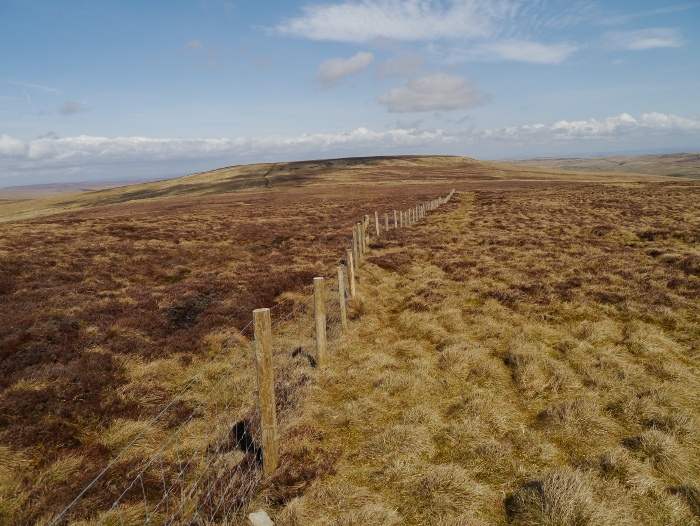 Route finding was easy up the broad grassy ridge, two sets of old fence posts leading the way. Behind me Stob a Chuir looked much bigger than the 717 metres on the map indicates. 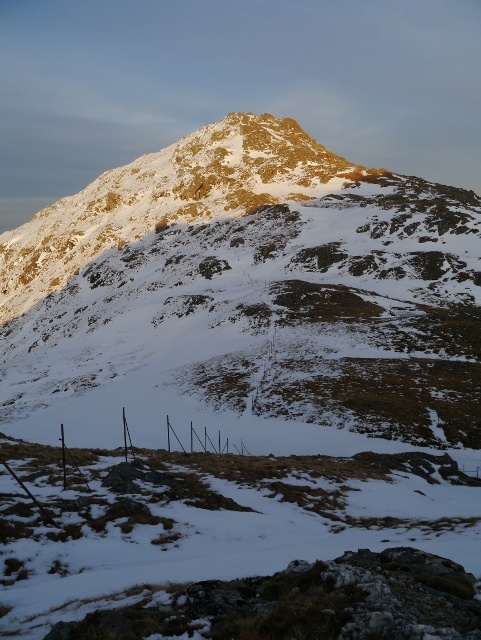 To get to Druim Tarsuinn I had to cross the subsidiary summit of Meall Mhor, a few metres lower. 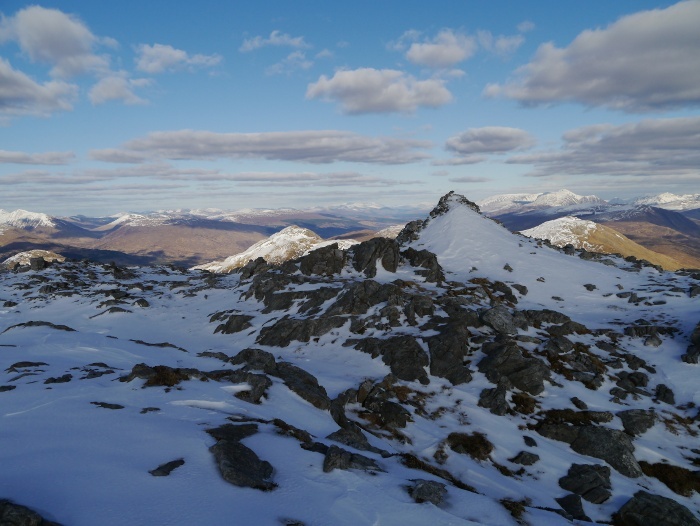 The snow on the summit was extensive, good firm stuff which allowed my boots a solid bite. 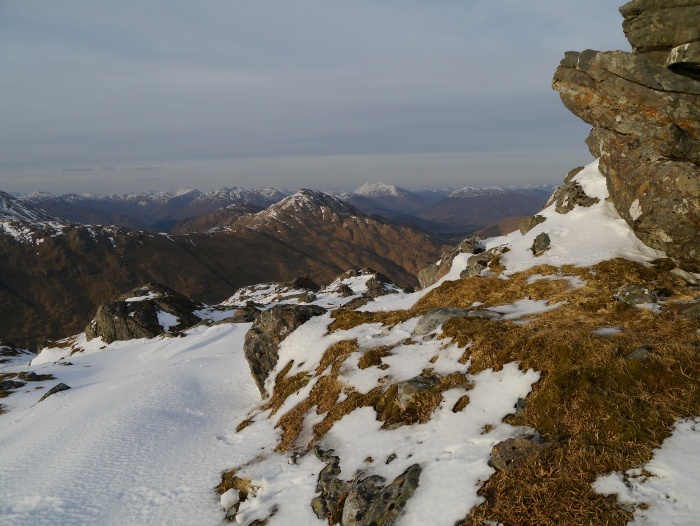 Crampons were not really necessary as the Meindl’s sole provided an astonishingly good grip. I was careful to avoid slopes where a slip could be dangerous. 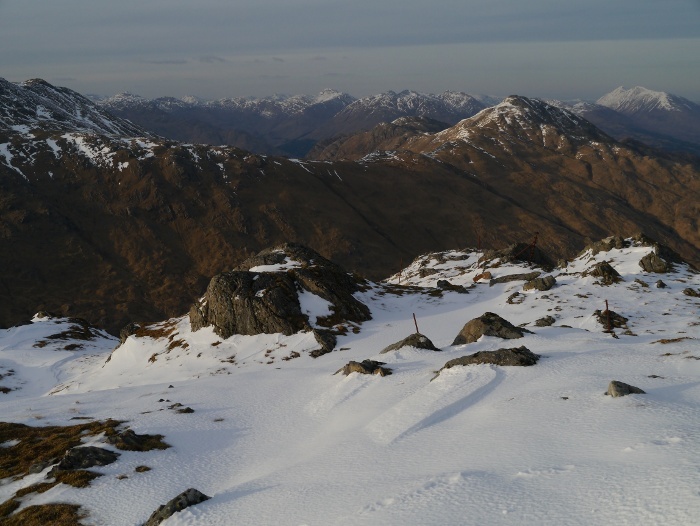 Once on the snow I yomped along, enjoying the satisfying crunch underfoot. 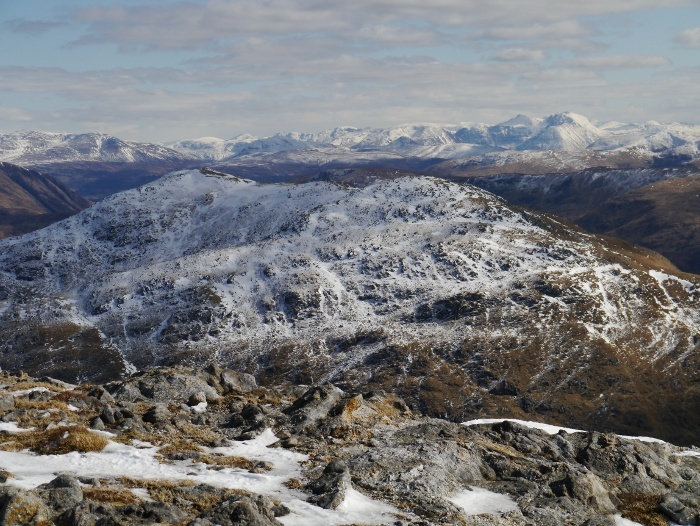 Even the subsidiary summit of Meall Mhor had a subsidiary summit. 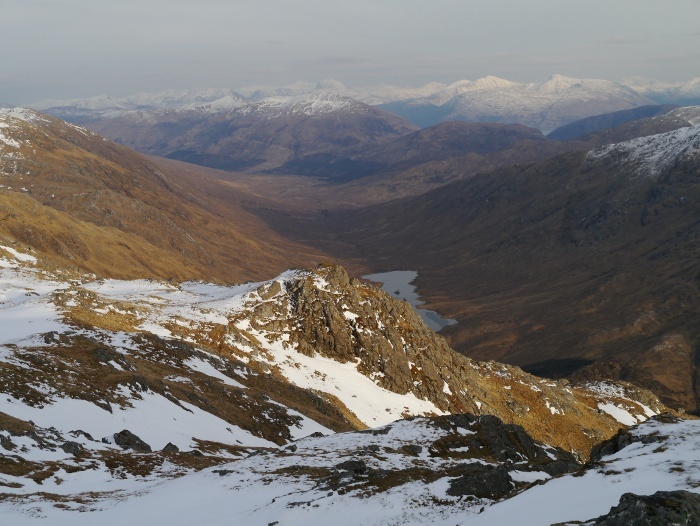 It was a steep clamber down the west ridge before the final climb of a hundred or so metres to Druim Tarssuinn. The sun was getting low in the sky, painting my surroundings with a soft glow. 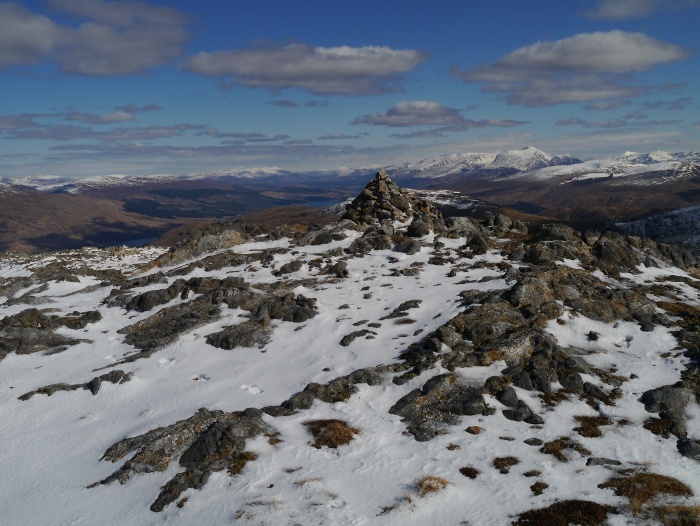 I sheltered behind the summit rocks and gazed out towards the west. 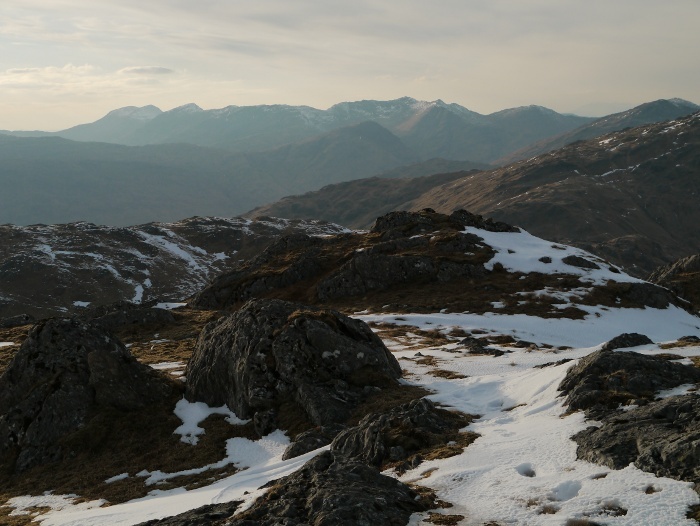 I could clearly see Ben More on Mull amongst an array of peaks that I could not identify. If it had not been so cold I could have sat there for hours taking it all in. Much more pressing than the cold was the fact that the sun was about to set. 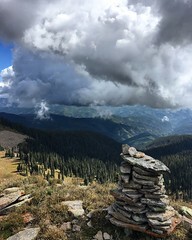 It had taken me longer to get to the summit than originally anticipated. 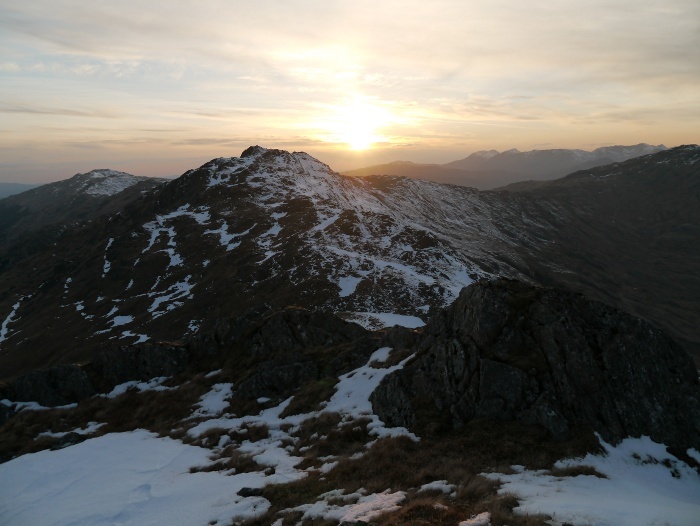 I did not want to be wandering these craggy snow-clad hills in the dark. 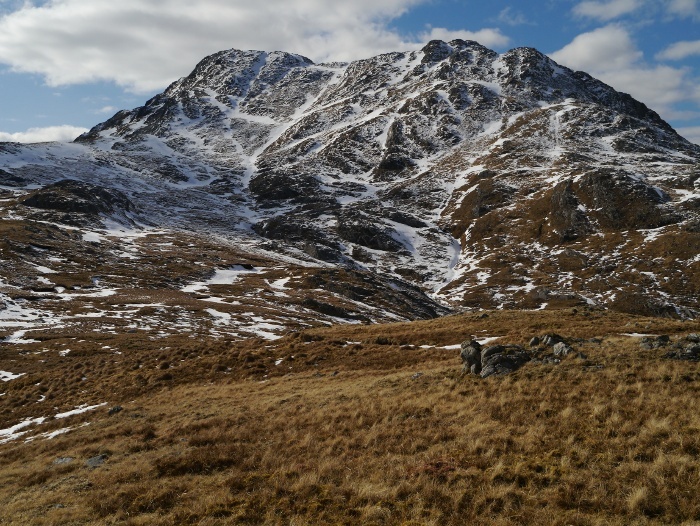 I started descending, coming face to face with Meall Mor which I would have to climb once more. It looked huge, capped by the setting sun. 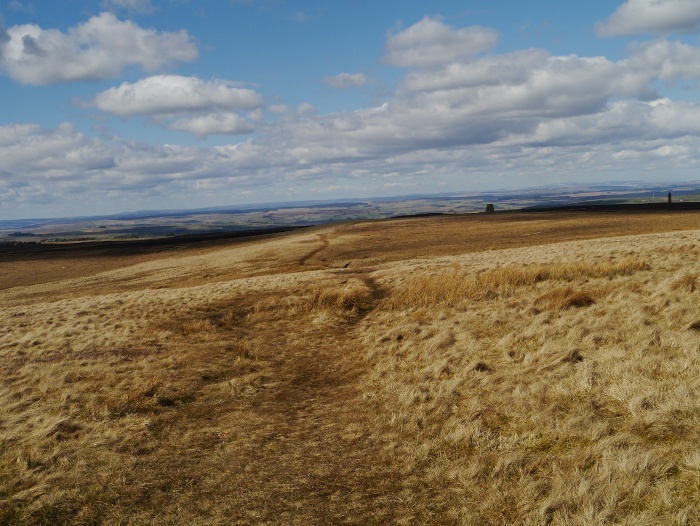 Steep slopes mean that height is gained quickly and I was once again close to the summit. Looking west I caught the sun just before it disappeared behind a bank of cloud, its rays doing little to penetrate the sub-zero temperatures. Crossing a large patch of snow I started to hear a strange noise and had the feeling of being followed. I nervously continued and then stopped, looking over my shoulder. There was nothing there and the noise stopped when I stopped. I repeated this several times, each time I stopped the noise stopped. I then realised that my right boot had developed a bit of a squeak. After the sun had gone down the sky took on a strange pink and purple hue. Once again I was transfixed but aware that time really was not on my side. I made it back to the tent literally moments before I could no longer see without a torch. 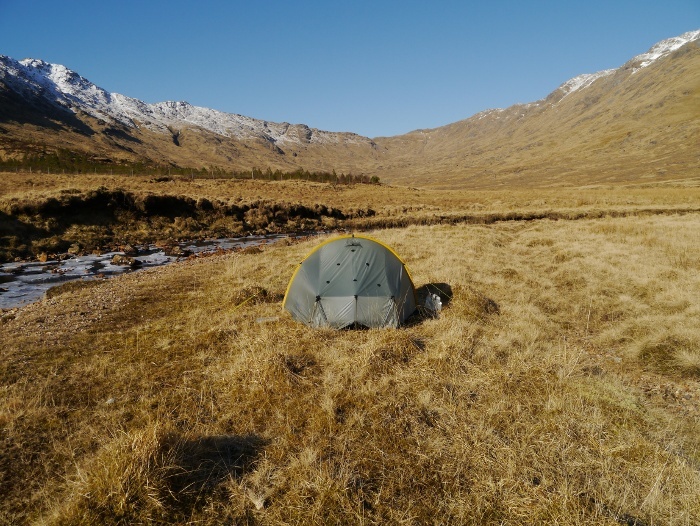 Although another cold night, camping above the glen stopped the temperature plummeting so low. After eating I settled down with my kindle to be sucked into a strange world conjured up by Haruki Murakami, where two moons hang from the sky. The previous evening I had decided that mountains would be off the menu today. Instead I would have a nice leisurely stroll down the glen to find a pitch not too far from the car. Because of this it was on the afternoon side of noon when I finally packed up. However before doing so I took the opportunity to photograph the Scarp1 in a wonderful location. 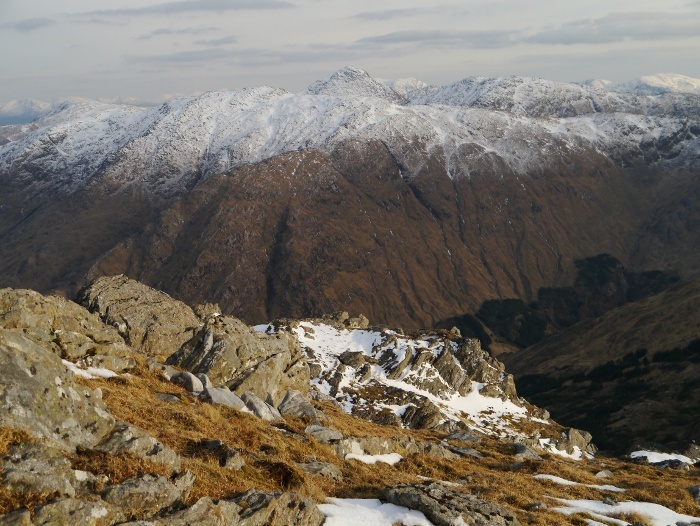 Prior to pitching the day before I had a quick glance at my route down into Gleann an Lochain Duibh. I have to admit that it had made me feel a little nervous as the slopes appeared to be almost vertical grass. It was therefore with a little trepidation that I set off on a course following the stream. It was indeed steep but I managed with unhappy knees to get to the glen floor in one piece. Not a descent to do in the wet. 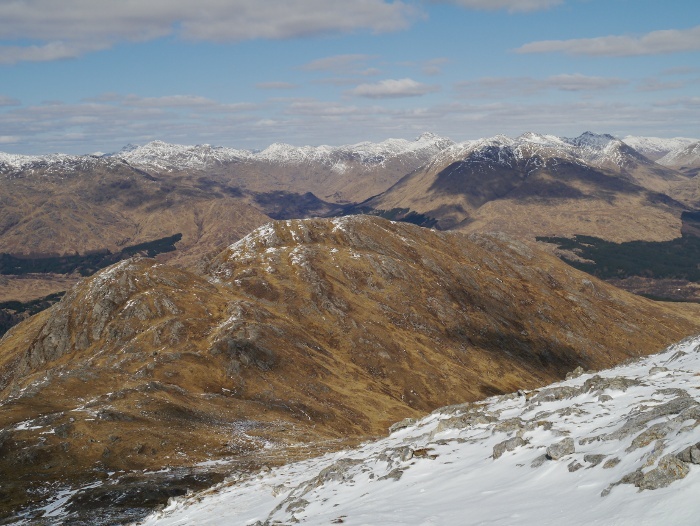 The scenery was as usual spectacular, first with views along upper Glen Hurich. 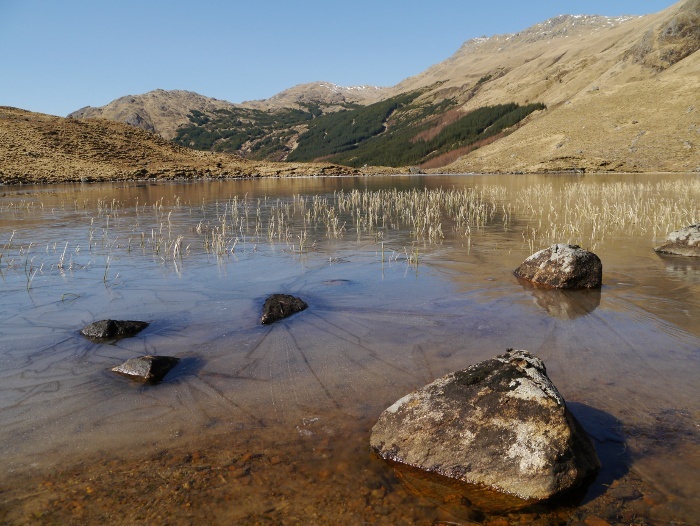 And down to the frozen Lochan Dubh. 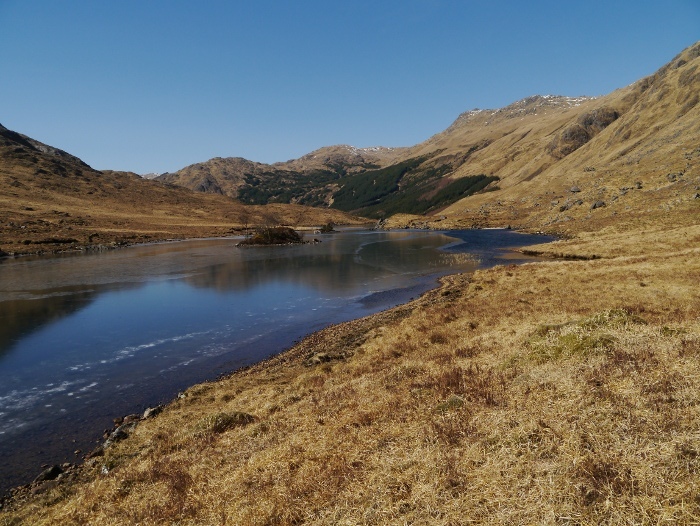 There was a curious optical illusion when I thought that I was almost level with the loch. It turned out that I was still over a hundred metres above. The leveling out of the ground after such steep slopes led my brain to believe I was walking on level ground. 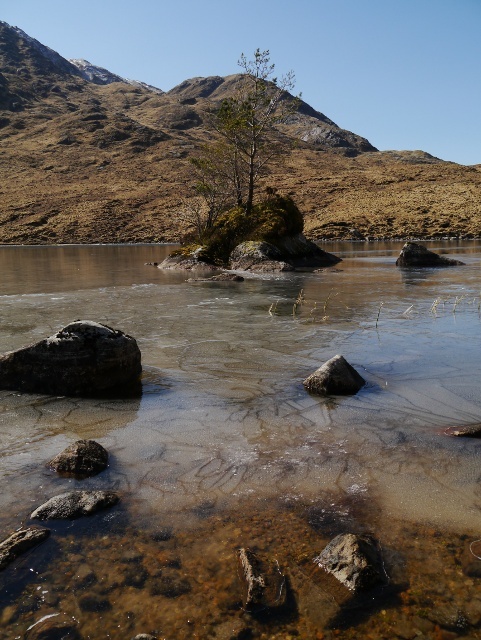 The shore of the loch was a fine place to sit, sheltered from the breeze it was only the ice that gave the game away that summer had not yet arrived. 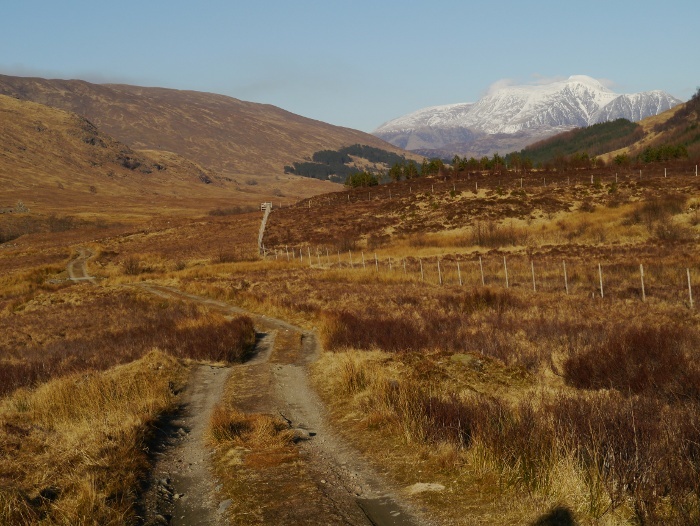 The path that is marked through Gleann an lochain Duibh failed to materialise on the ground until I was half way along it. I can’t imagine that it gets much foot traffic, therefore the surrounding bogs must have swallowed it up. Close to where the Gleann an lochain Duibh meets Gleann na Cloiche Sgoilte I spotted a lush patch of vegetation that was sheltered on two sides by a rocky outcrop. It looked a perfect spot to sit and cook some lunch. Sitting there in my base layer I felt very pleased with myself. However that feeling did not last very long. You may have noticed that I have not used the word ‘tick’ once yet in this write-up. Due to the cold weather and frozen ground they had been completely absent. However sitting there in that very warm microclimate I picked up my food bag and noticed that its surface was crawling with the little critters. In fact everything that I had dumped out of my pack was. What was meant to be a leisurely break was spent moving elsewhere and then flicking each and every one off. They were at the nymph stage so absolutely tiny. Thankfully I only found one latched onto my leg in my tent that night, and I was given the all clear the following day when I presented my naked self to my wife. 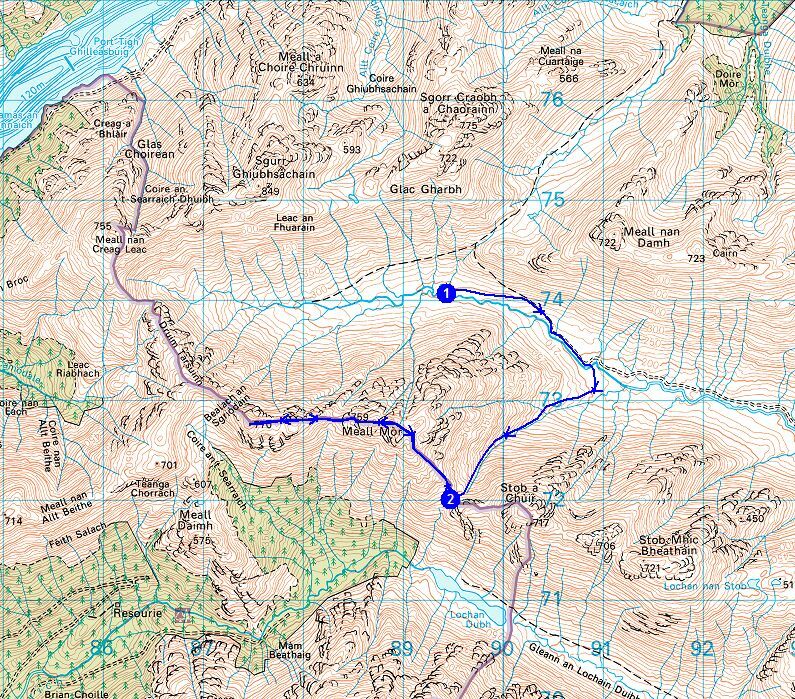 With lunch finished I continued down the glen, trying to work out where Andy had spent the last three nights camping. It certainly was a lovely location with green swaths of grass close to where the two rivers met. The path turned into a landrover track, the going easy. 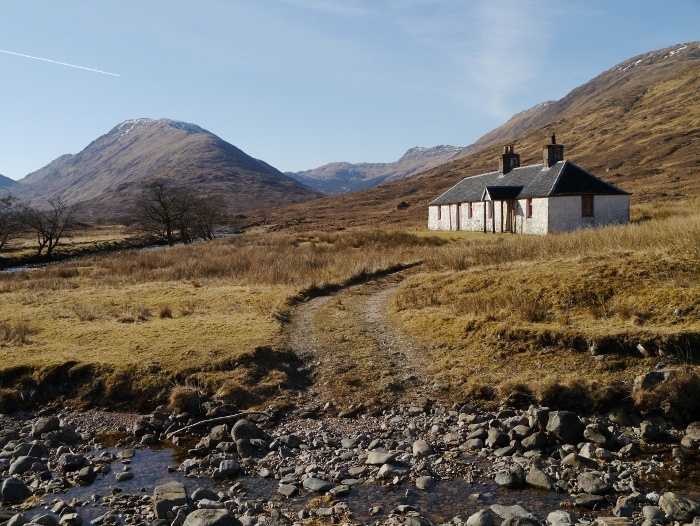 The bothy of Tighnacomaire was firmly locked and shuttered, a sign pointing the way I had come for overnight shelter. I had passed a tin hut but had not explored as I assumed it was an animal shelter. Probably not somewhere I would willingly spend a night. 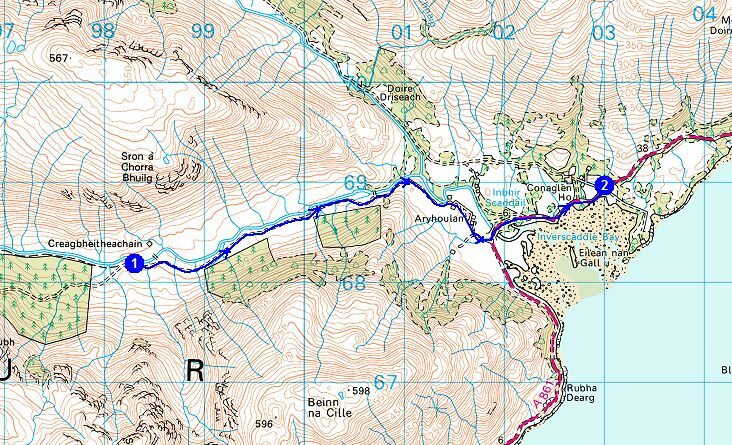 The walk along Glen Scaddle has a bit of a sting in its tail. 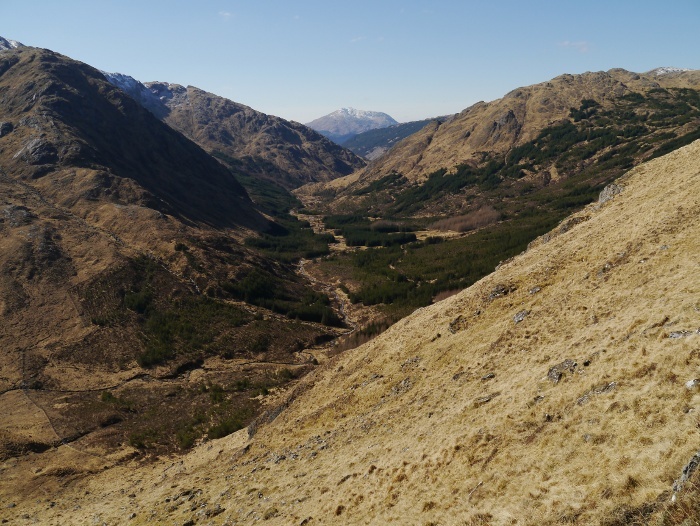 The path that follows the river is meant to be rough and hard going, leaving a forestry track as the main option. This climbs up the hillside, views hidden by the trees. Despite this it gave pleasant walking and shelter from the sun. 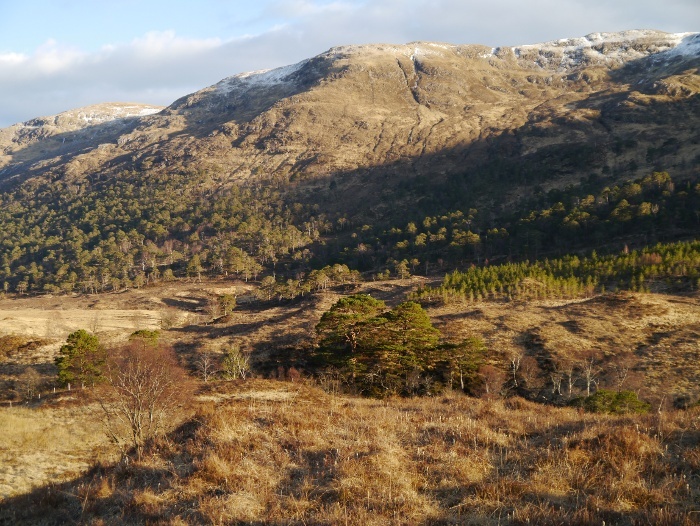 A clearing gave views up to the head of the glen. I would image this would get the pulse racing in anticipation if coming the other way. 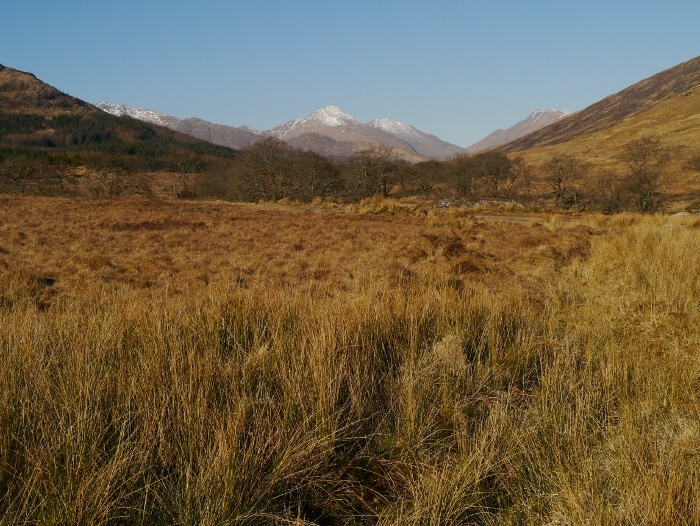 Clear of the trees, a snow-capped Ben Nevis was visible, a great bulk of a mountain. 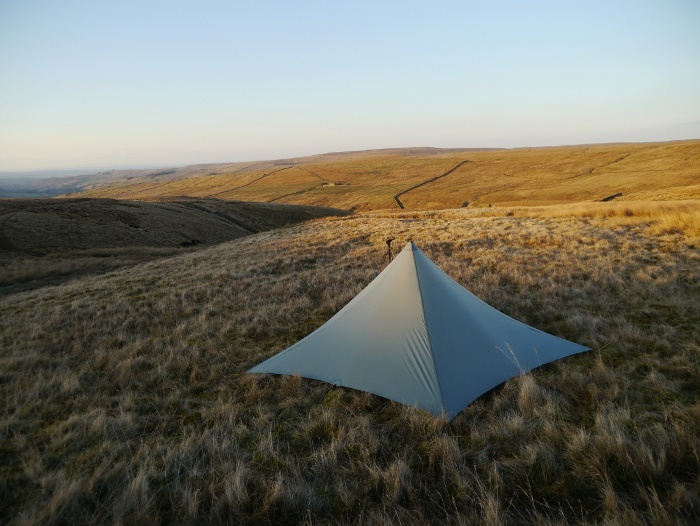 I started to scout around for a spot to pitch for the night, I did not want to get too close to civilisation on my final night in the hills. I found a good spot right next to the river. 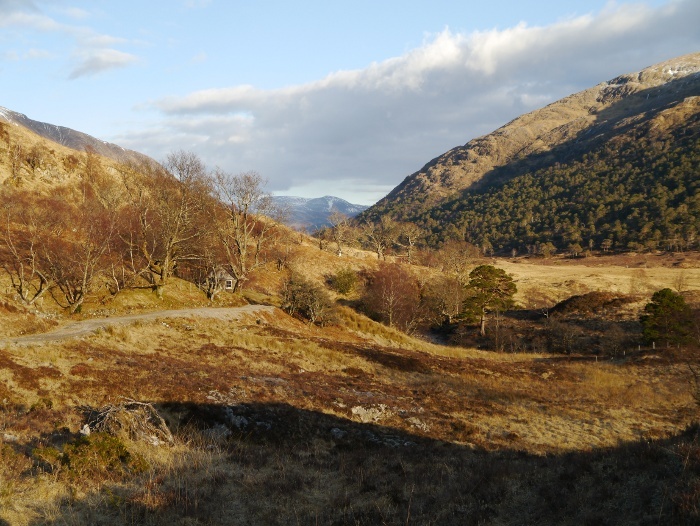 For once it was still early, the sun shining on my side of the glen. I enjoyed its warmth, knowing that cold air would soon be enveloping me once more. I had my best nights sleep of the whole trip. I remember at one point before drifting off thinking just how warm it felt inside the tent. It was only -1C, which gave me a false sense of security. I failed to bring my water inside the tent and wrap it in my pot cosy. My alarm woke me before dawn and I sat up to a flurry of ice crystals. My outer bag had frozen solid and everything had a coating of hoar frost inside the inner tent. 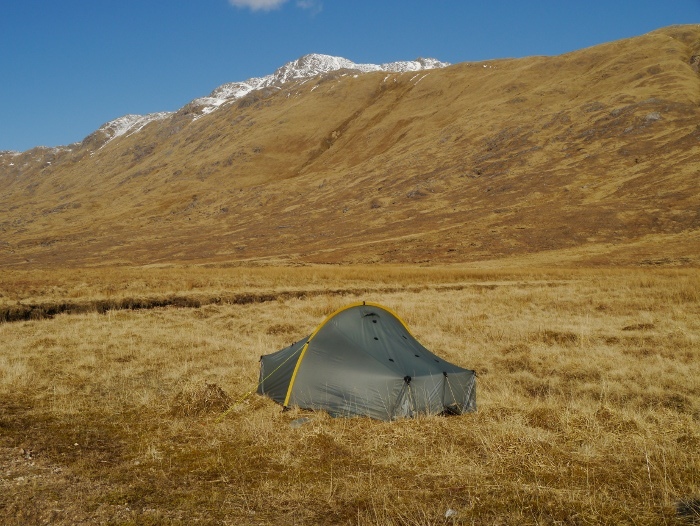 I measured -7.5C, so it was probably the coldest night I have slept in a tent. The platypus in the porch was a solid block of ice. Although my boots were dry, they were also a solid block of ice, which sucked all warmth out of my feet. Fully dressed in a down jacket and with coffee in hand I walked up and down the track for a bit in an attempt to warm up. The worst thing was taking the tent down, the cold made my hands numb and then burned when they finally warmed up. 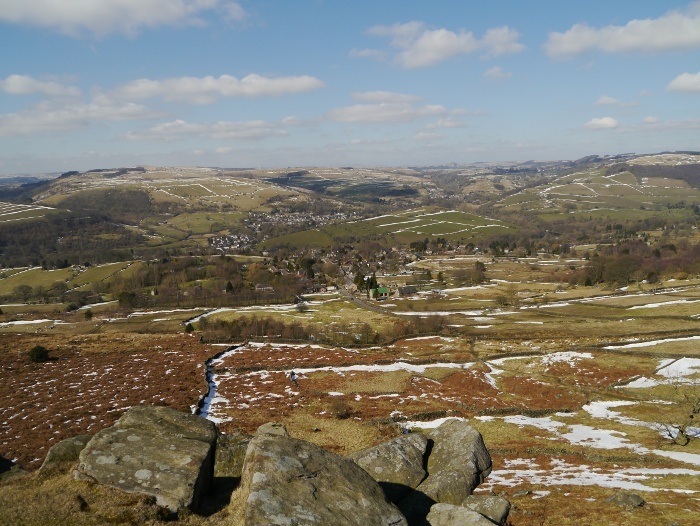 I was glad to get walking and once the sun filled the valley, the frost was chased away with the shadows. It was a short walk back to the car, once again in glorious weather. I really could not believe my luck, it’s not often that I have got five days in a row like this. 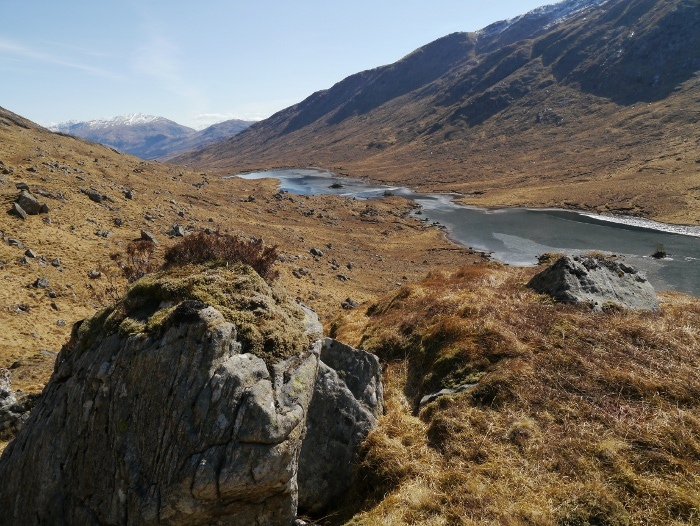 Let’s hope the sun shines for two weeks whilst 300 people walk across the Highlands in May. I sneaked out of Nottingham before dawn on the Good Friday, heading north fuelled on pain au chocolat and strong coffee. Surprisingly traffic was light and seven hours later the Real food Cafe in Tyndrum made me part with my cash for their fantastic fish and chips. 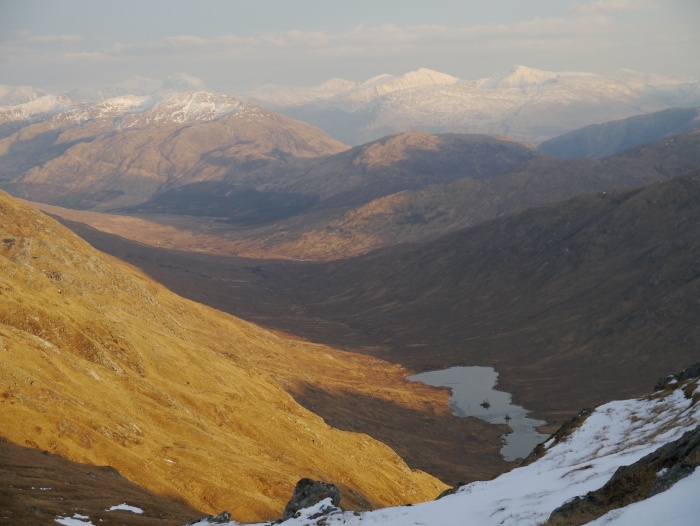 With a happy stomach I did the best I could to keep my eyes on the road whilst passing Rannoch Moor and Glencoe. 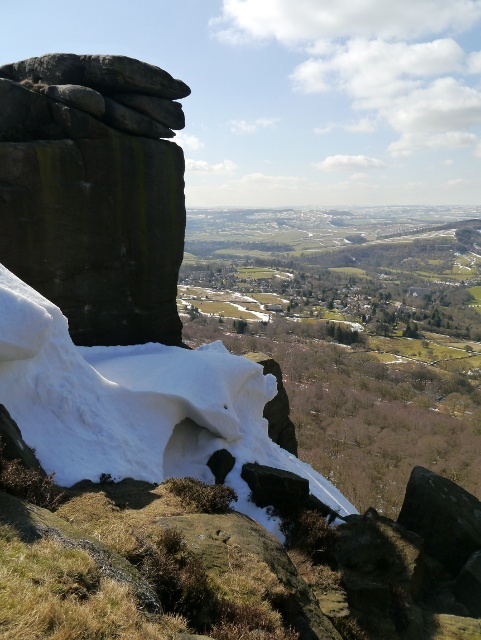 The Peaks were absolutely plastered in white, dazzling in the sun under a blue sky. I timed the Corran ferry to perfection. I approached the slipway just as the last of the vehicles was loaded, getting on in the nick of time. 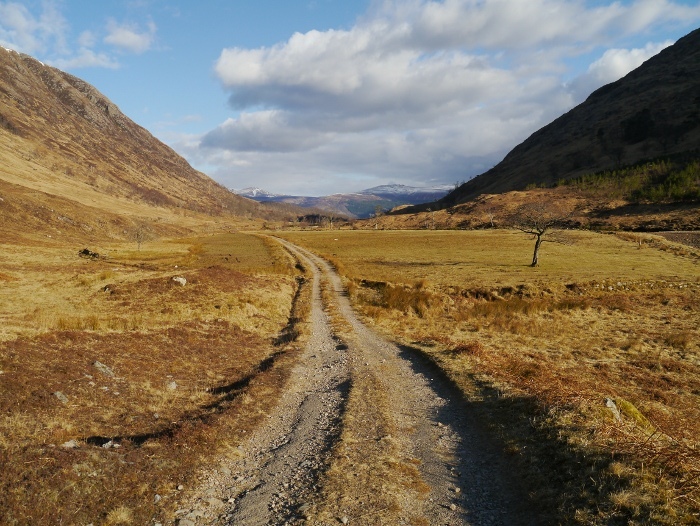 Five minutes later I was the only vehicle that turned right on the single tracked road, the rest heading towards the fleshpots of Strontian. Although only on the other side of Loch Linnhie it felt a million miles from the bustling A82. 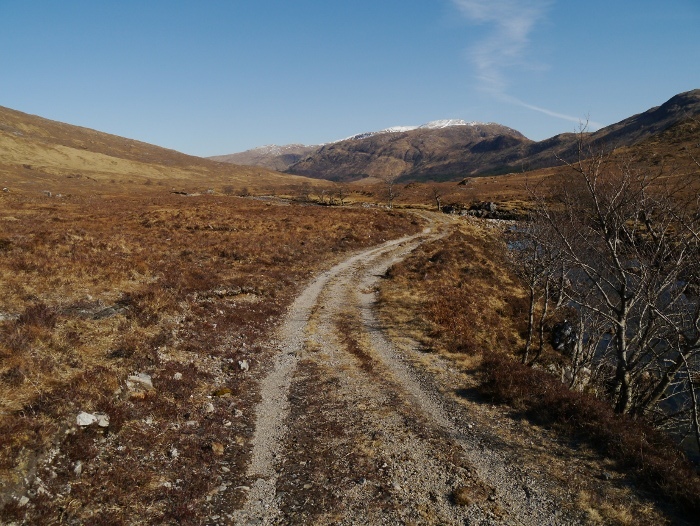 There is space for several vehicles to park at the entrance of the Cona Glen, although I was the only one. As I got out of the car the sun was beating down and with no breeze it could almost have been mistaken for summer. On this side of the Loch the hills around me appeared to be almost free of snow, although I could not see further up the glen. This gave me a bit of a dilemma. Would I need the ice axe and crampons that were in the boot or should I just take some microspikes instead? In retrospect a bit of a daft debate to be having in a warm sheltered valley. In the end I just took my crampons. Now was that a wise decision? Once past a couple of buildings I had that wonderful feeling that you get when entering wild country. I knew that each step would take me further and further away from the hum drum of daily life. I passed and was re-passed a few times by an estate worker on a tractor feeding deer. Finally he rumbled off down the glen leaving me with the sound of silence. For the next four nights I would be alone, the only contact with the outside being if I could get reception on the summits to call my wife. 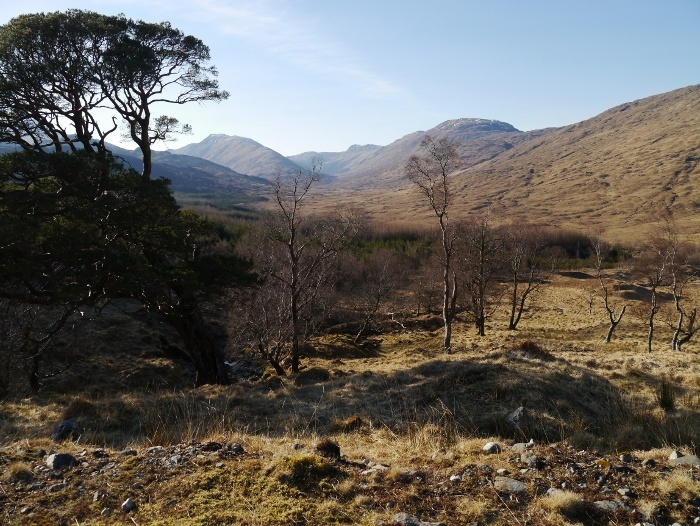 The lower part of the glen has some beautiful woodland around Doire Driseach, an area I had initially planned to camp. Even after driving for nine hours and it being past 4.00pm I decided to push on and see how far I could get before dark. 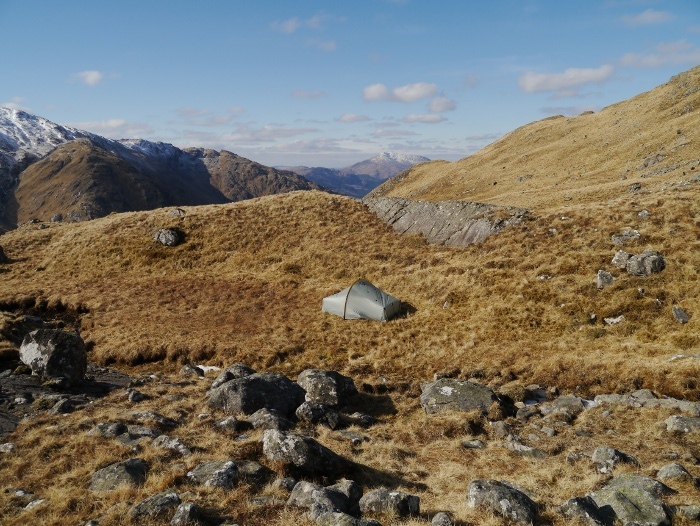 It has to be said that there were many tempting places to pitch a tent within that first hour. 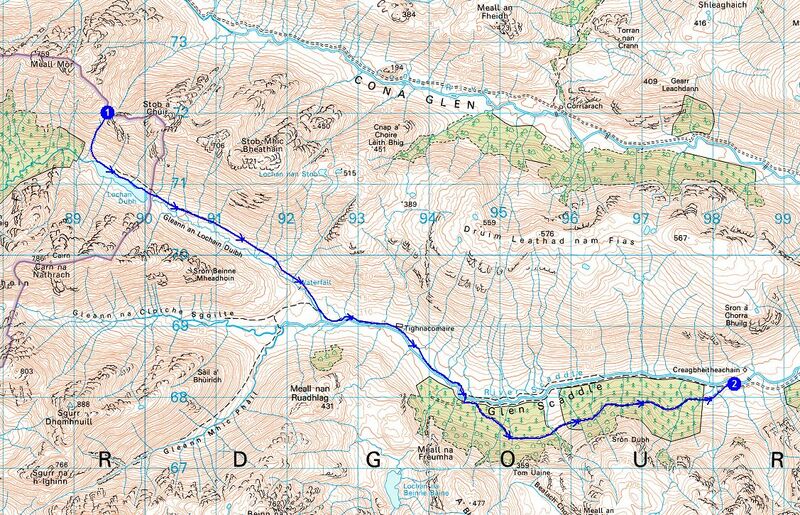 The track gave rapid progress and I was soon passing the Corrlarach bothy. Unfortunately it was locked and after pressing my nose against the windows I walked on. I was rather jealous of its location with some grand looking Scotts Pine nearby. 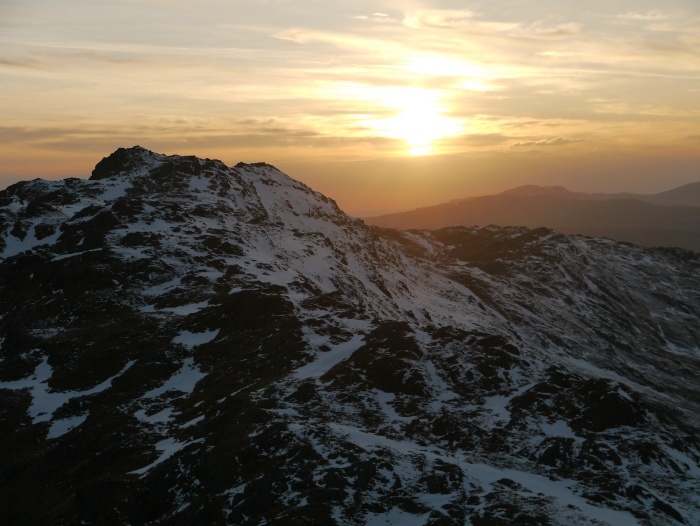 The air was absolutely still and I soon worked up a sweat, stripping down to just a base-layer. 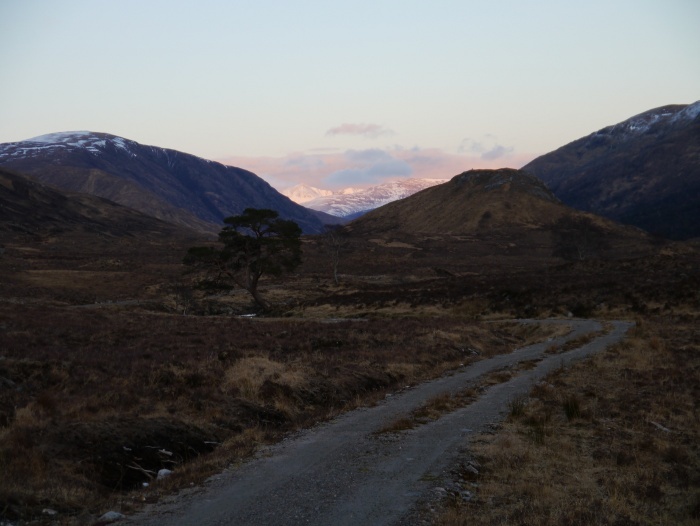 I was getting tired but decided I would camp right at the head of the glen no matter whether darkness overtook me. Further up a strange conical mound rises above the river, from that point onwards the scenery would take on a wilder feel as the last of the trees were left behind. The sun dipped below the mountains in front of me and immediately I had to pull my jacket back on. 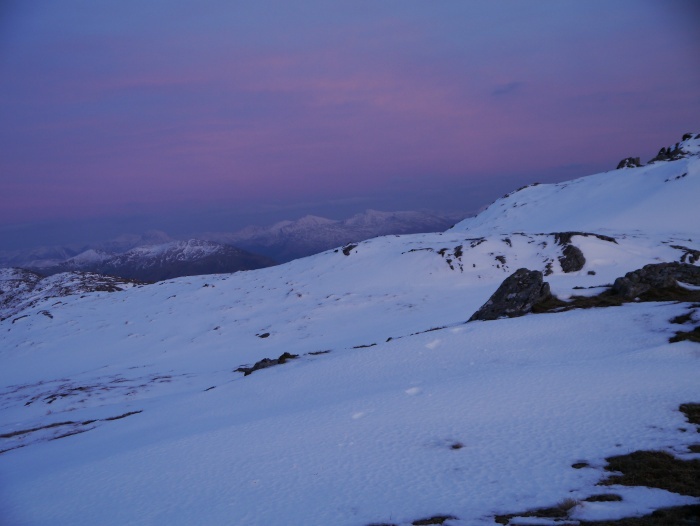 Looking east I noticed that Ben Nevis had taken on a pink glow, everything lower plunged into shadow. I retrieved my torch from my pack, ready for when my eyes finally needed battery operated assistance. 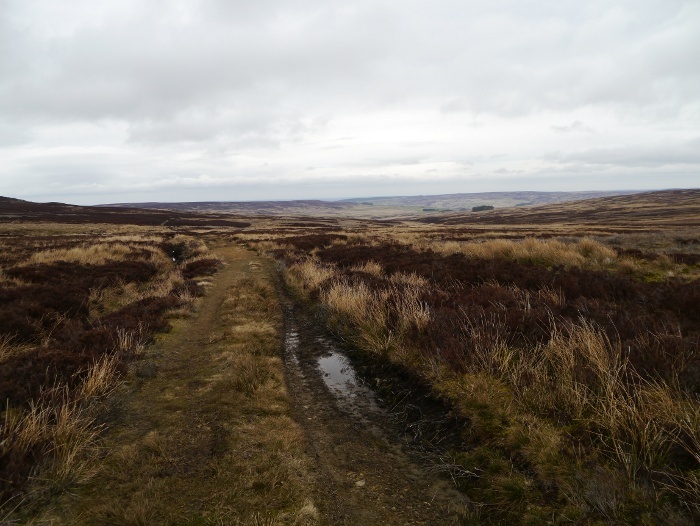 The solid landrover track was replaced by a much older and rougher version, ruts through the bog and heather. 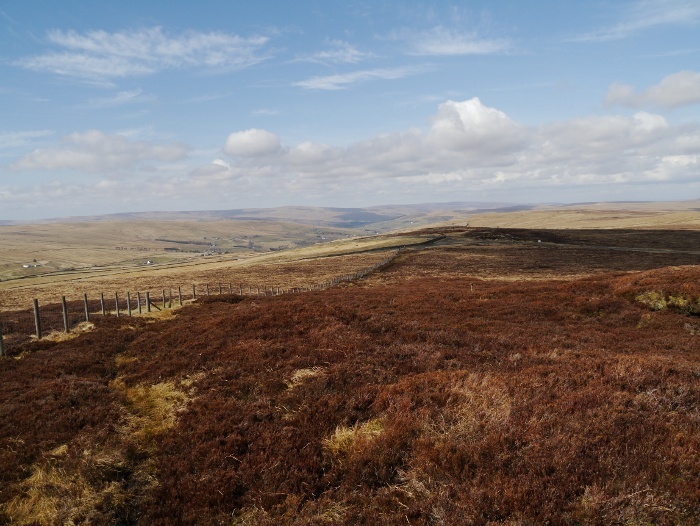 The illusion of being in the middle of nowhere was soon shattered when I came across several diggers, mounds of earth and a mashed up looking landscape. This part of the track was being upgraded, starting higher up and working its way down. I hope that nature takes its course and heals the wounds. As darkness started to approach I noticed an unusual smell in the air. A sharpness that burnt my nostrils. With the air perfectly still and dry and with stars starting to appear overhead, I realised what it was. It was the smell of cold descending on the glen. The final few minutes were undertaken by headtorch, I finally arrived at a large loop on the river where cropped grass provided a perfect spot to camp. As I was pitching frost bagan to form on the tent in front of my eyes. I measured -4C and it had only just got dark, it was going to be a cold night. It was a night of extraordinary coldness but also dryness. As one point I blew my nose to find within minutes the tissue had frozen solid. The river that I was pitched next to became silenced in the night as ice imprisoned its surface. 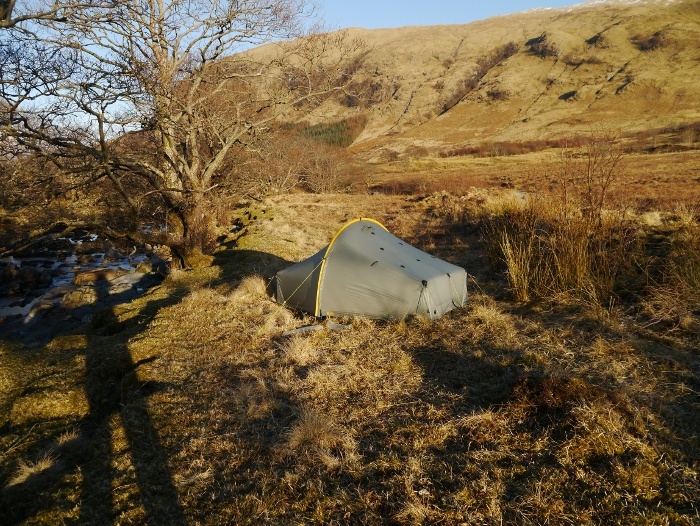 I woke to find the sun warming the tent and the sound of the river cracking and groaning as the ice started to recede. I was quickly up, a coffee in hand to take in the spot that I had arrived at in the dark. And what a spot it was! 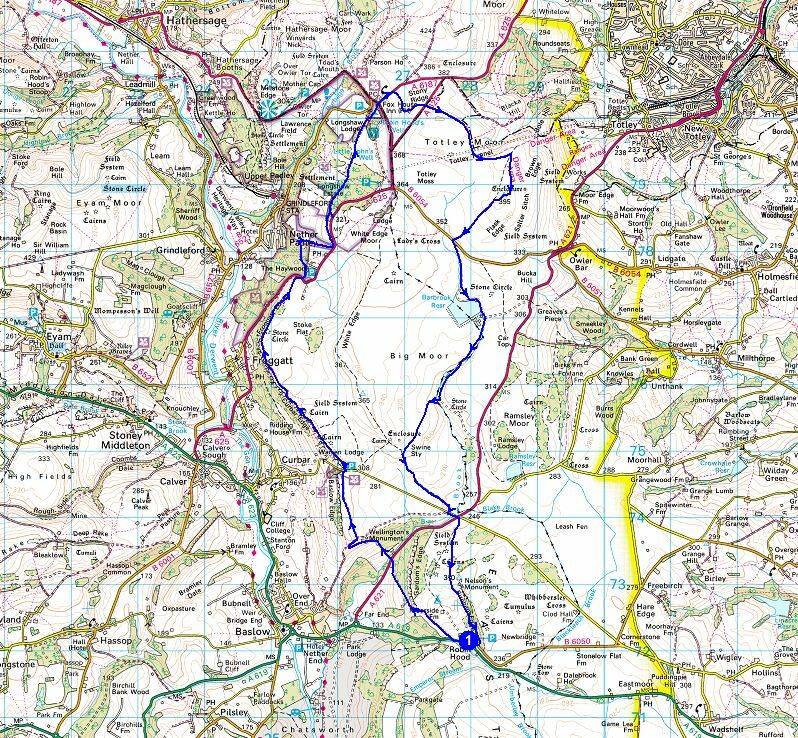 The night before I had decided that I would not do the planned long glen route, but instead take it easy and try to summit a few hills. After breakfast I packed a few things in my sack and left the tent to relax in the sun. 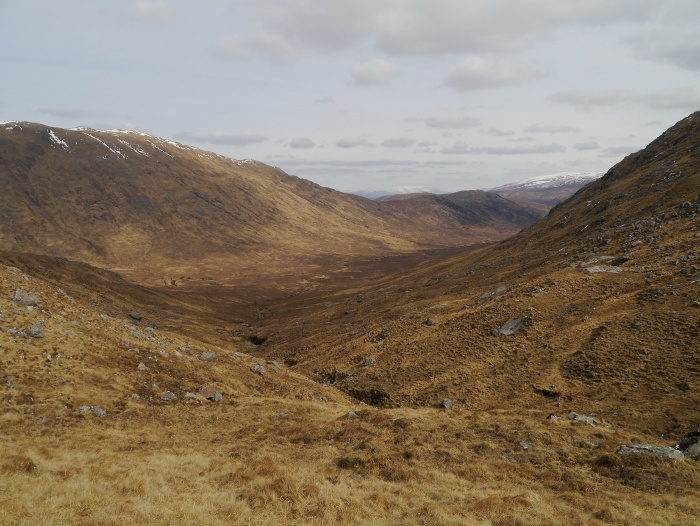 The terrain was immediately steep and rough but I was quickly getting a measure of the scale of my surroundings, the river cutting a large loop across the head of the glen. 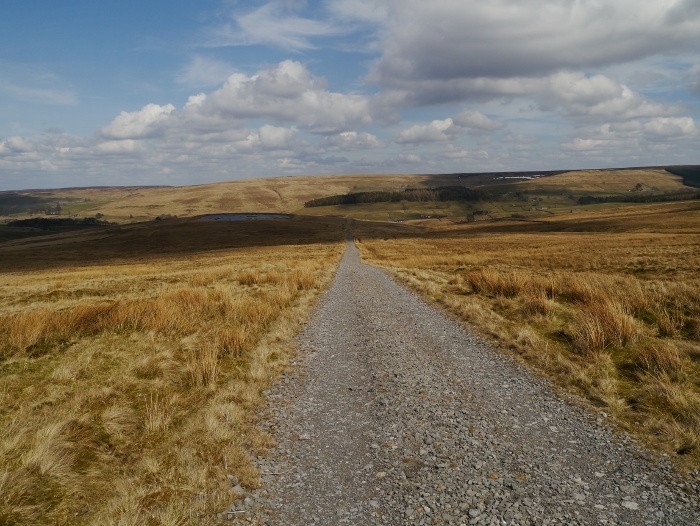 The main track to Callop was reached and I enjoyed a short distance without being pestered by contours. 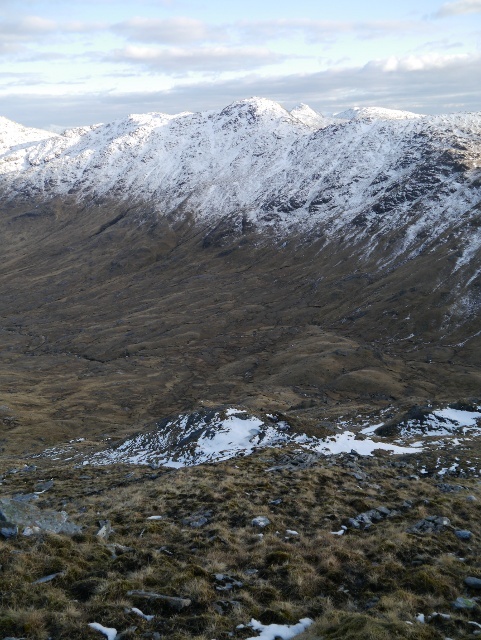 The track soon continued downwards and I started up the steep trackless slopes of the Corbett Sgorr Craobh a Chaorainn. 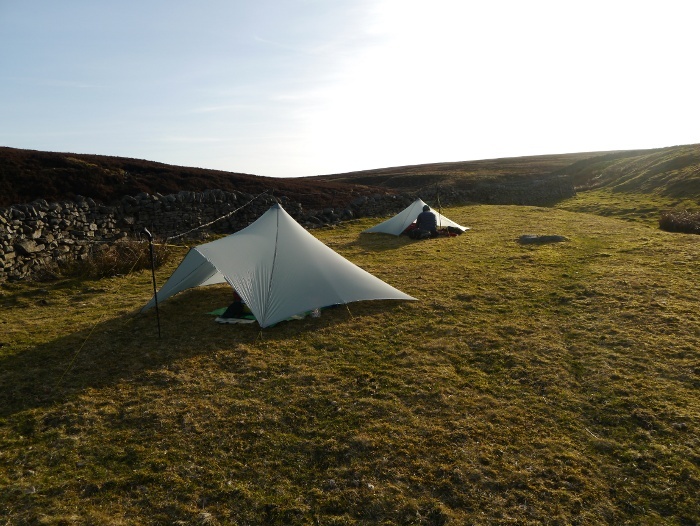 With a lack of general fitness it was tough going, but I reminded myself that at least all my heavy gear was in the tent and not on my back. 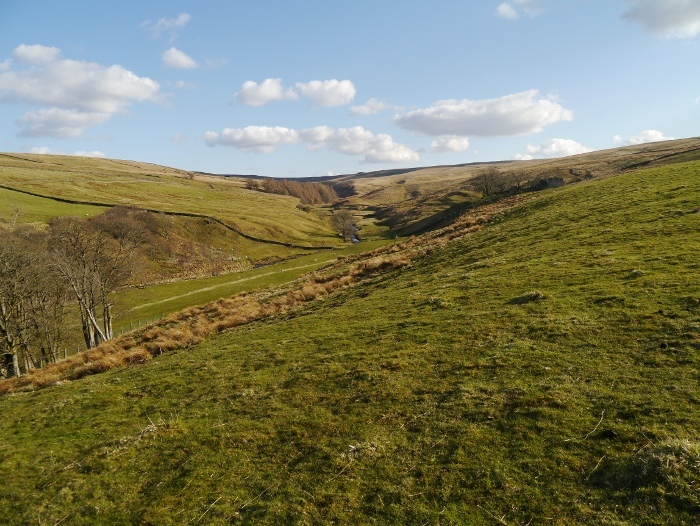 I was soon resting and enjoying the view down the Callop Glen and towards Streap. 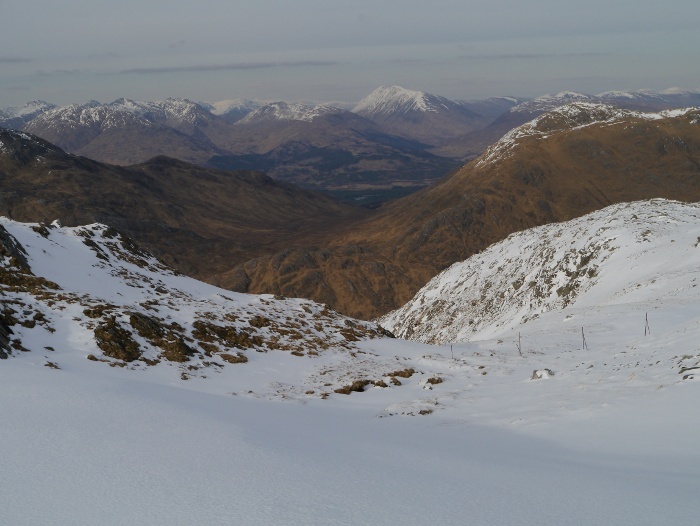 Whilst at the same time eyeing up the steep and rough slopes that I still had to climb. I always find that once a good amount of height has been climbed something switches in my mind and the going becomes easier. 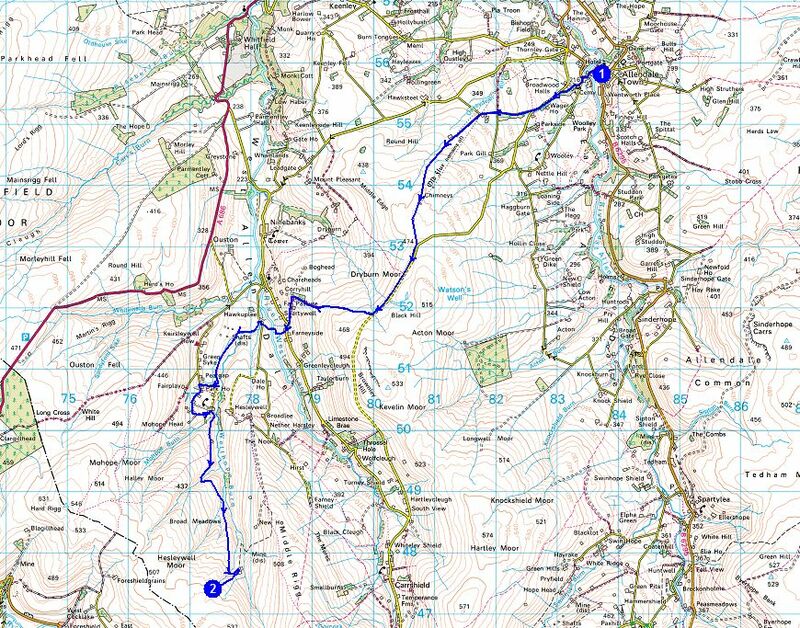 For some reason that usually comes at about the 600 metres contour. Maybe my legs and lungs sense that the ordeal will soon be over. 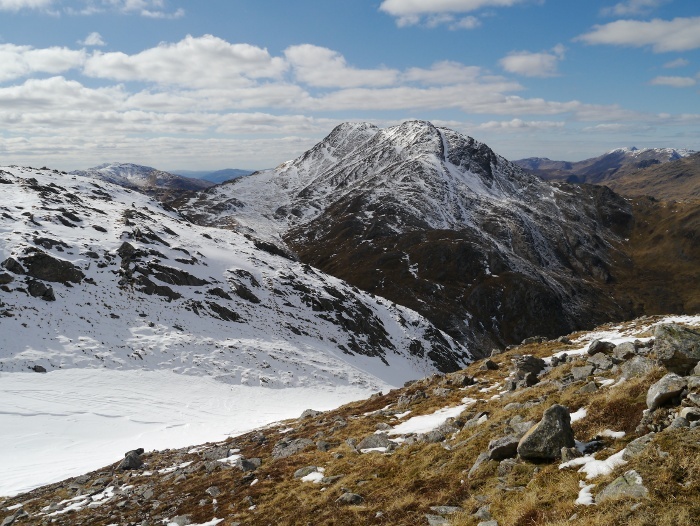 Arriving at a col below the main summit I got a good view of Sgurr Ghiubhsachain which I had planned to be my second Corbett of the day. The steepness of its slopes and the snow made me feel just a little bit nervous. 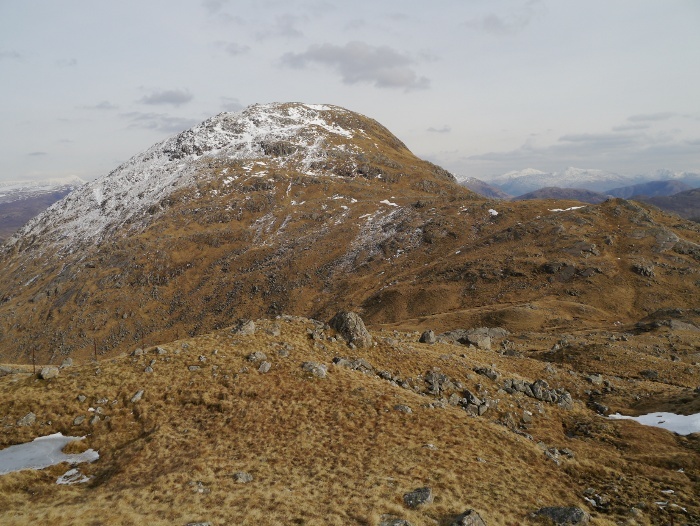 The actual summit of Sgorr Craobh a Chaorainn is guarded by a line of cliffs on the south western side, these looking rather formidable when I saw them for the first time. However I spotted a line through easier ground towards the south. 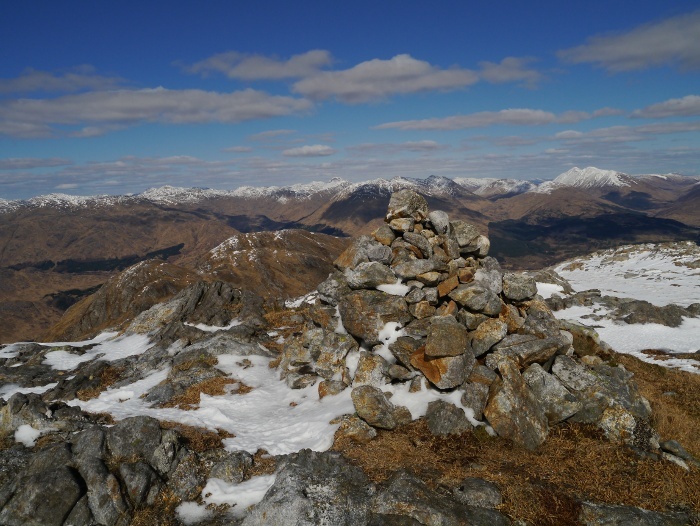 The going was rather steep and loose but I soon found myself approaching the summit cairn. 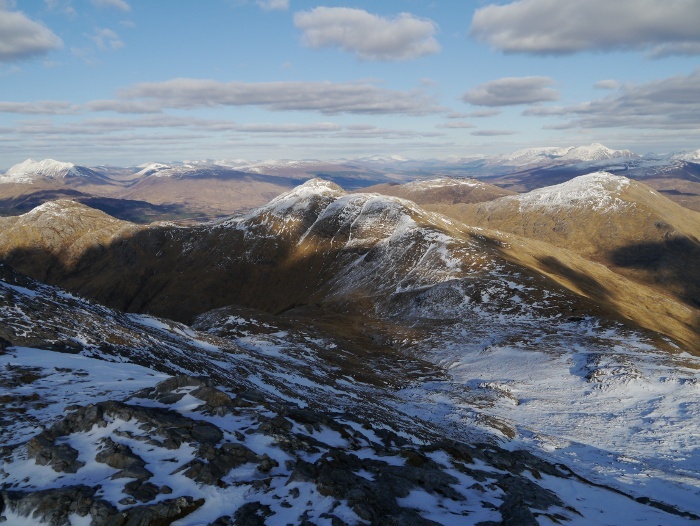 For such a low summit (or because of it) the panorama was simply breathtaking with the crystal clear air. 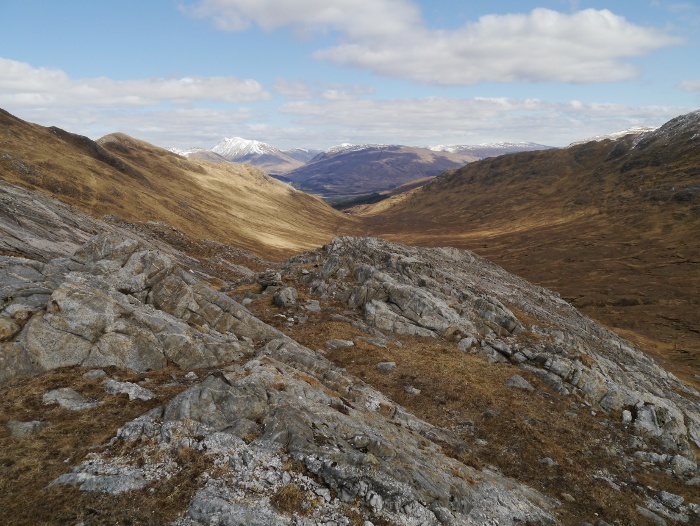 Ben Nevis took centre stage but also on offer was the length of Glen Spean, the Glencoe hills and an array of peaks spreading towards Knoydart. However more than a match for any of the famous showstoppers was the rugged land closer to hand. I could not understand why the place was not crawling this bank holiday weekend with such good weather. They say that a picture is worth a thousand words, so I will let a few do the talking. The descent was tricky whilst I searched for the line I had used on the ascent. It’s amazing how things appear so much steeper when going downhill. 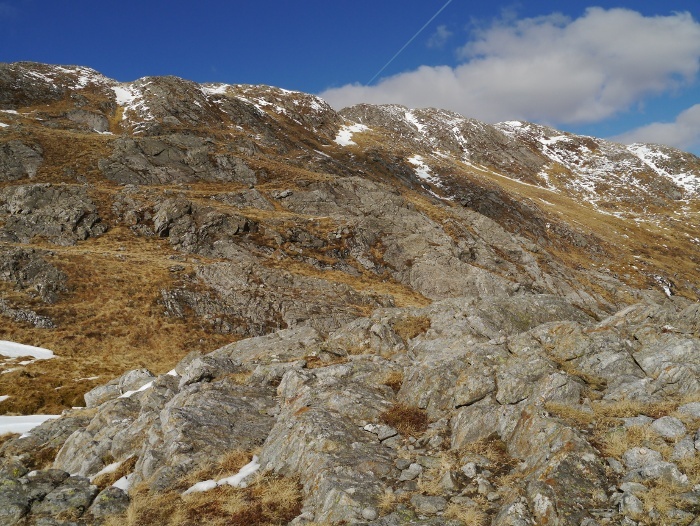 Once back below the cliffs it was an easy yomp downhill to the col followed by an ascent up grassy slopes. 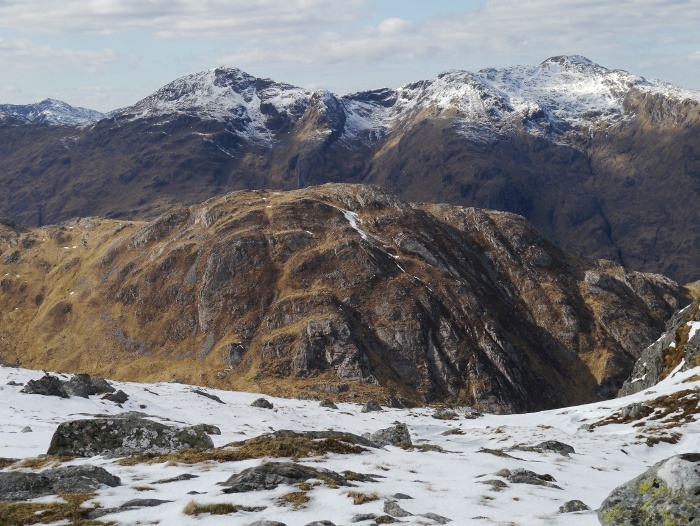 The rocky summit of Sgurr Ghiubhsachain began to look intimidating, the route mentioned in guidebooks appearing as a solid wall of snow-covered rock. 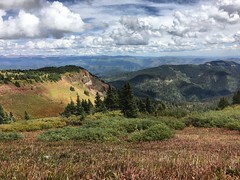 The map suggested that it could be possible to bypass the steep rocky section and sneak up to the summit through a breach in its southern defenses. 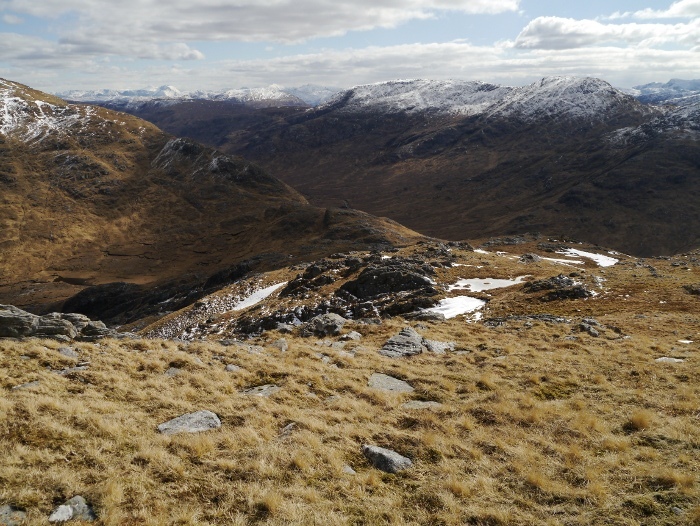 A grassy contouring line below the crags gave a view down the entire length of Cona Glen. The final half hour to the summit is one that I will file away in the memory bank with the label ‘Experiences learned’. 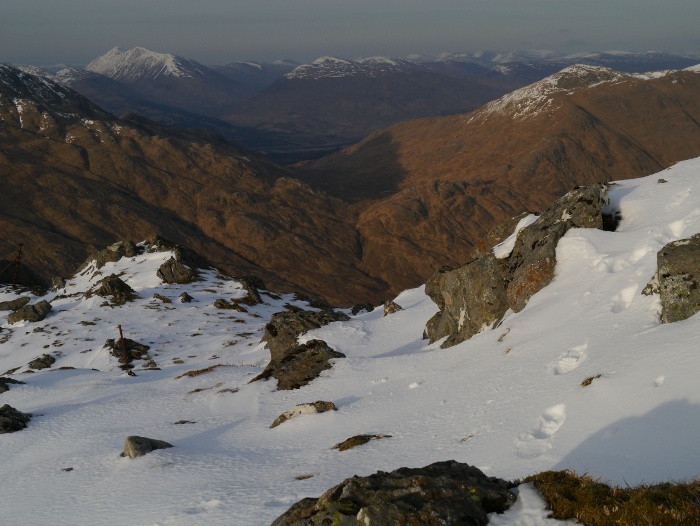 The plan to sneak around the crags was going well until I came across a large wide gully filled with snow. This was south-facing so had turned into slippery mush. My crampons were rendered useless and instead an ice axe would have been the tool to use just in case I slipped whilst trying to get across. 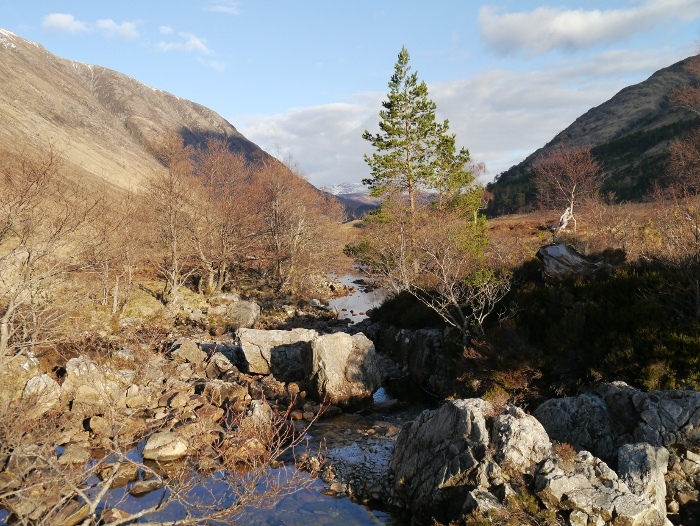 There was no way I was going to attempt a crossing without, as any slip would have meant a fast exit into the glen below. I spotted a series of snow free grassy ledges above so started the process of linking them together. This turned out much harder than anticipated and there were a few worrying moments of climbing up ribs of rock that were steeper than I would have liked. 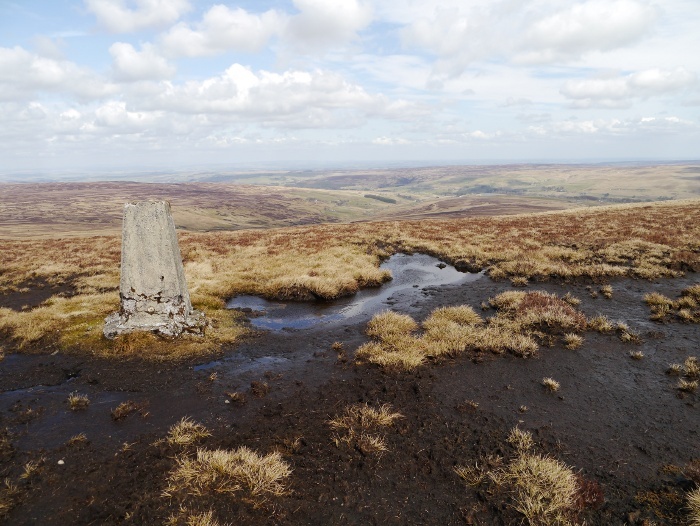 My knees were knocking a bit by the time I reached the trig point. I should have simply stuck to the established route. The view was good though! 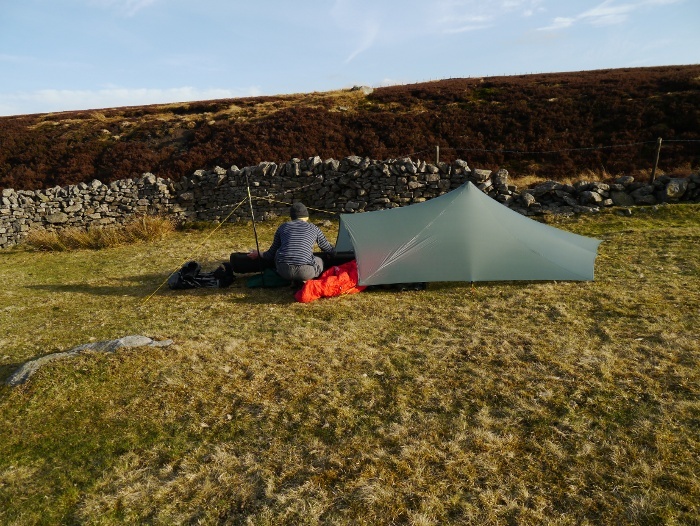 I knew that fellow blogger Andy Jones from Surfnslide was in the adjacent glen doing a spot of Corbett bagging with a mate. There was talk of trying to meet up. Therefore I fired a text to see where they were camping, letting him know that I may turn up the following evening. 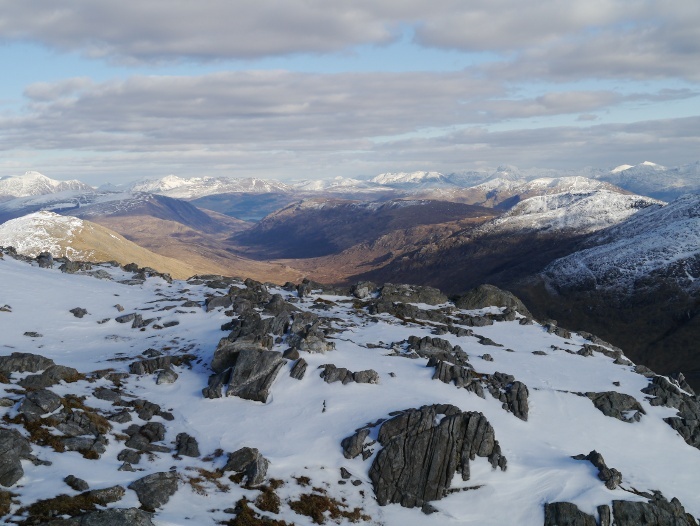 Thankfully the south-west ridge provided a much gentler descent, the view towards the Glenfinnan viaduct being one of mountain perfection. 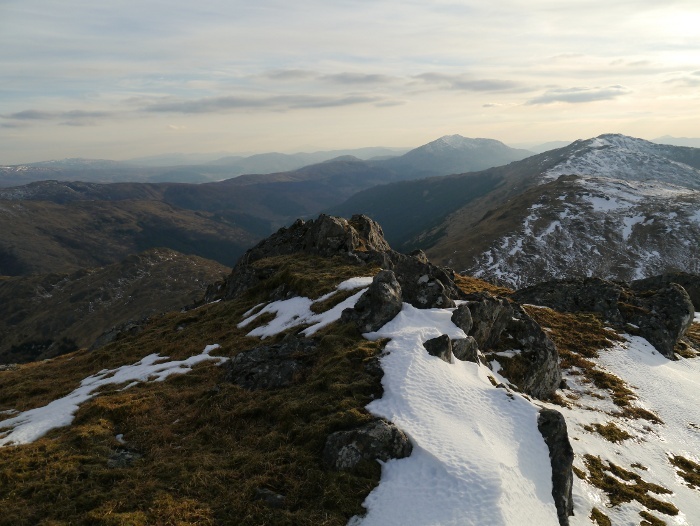 My original plan had been to continue over the subsidiary summit of Meall nan Creag Leac but I could not summon the energy. 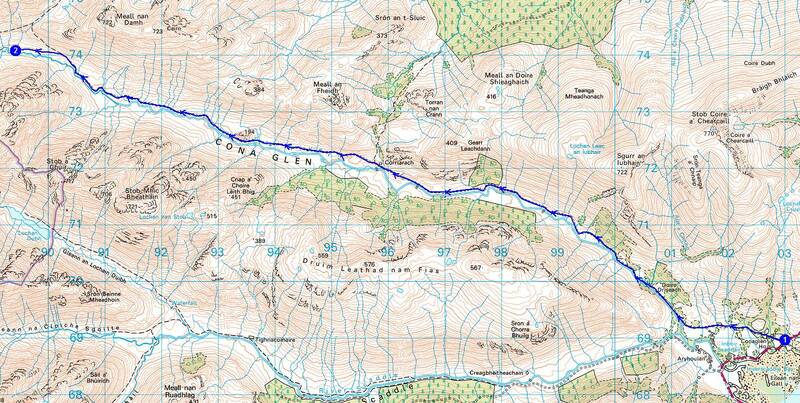 Instead I took a knee jarring descent straight down into the glen, which now looks seemingly impossible on the map. 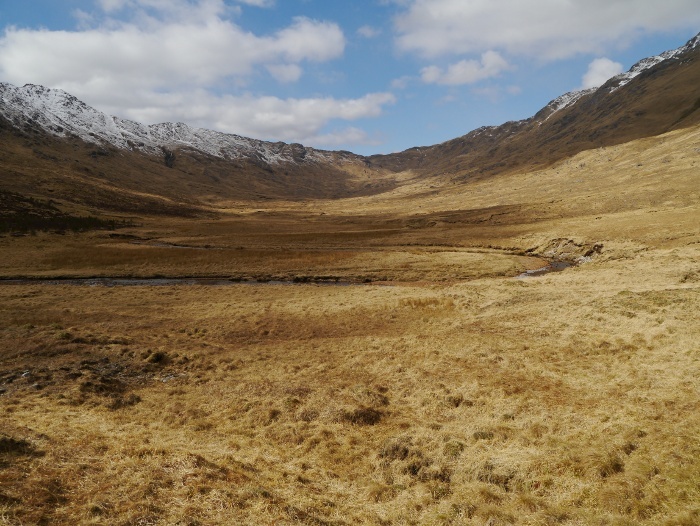 The Corbett Druim Tarsuinn which would hopefully be my objective the following day looked to be even more plastered in snow and down to a lower level. Once again it was pretty much dark by the time I got inside my tent, the temperature already having plummeted to the wrong side of freezing. Lesson learned so far on this trip: Never judge mountain conditions by peering up from a warm sunny valley!